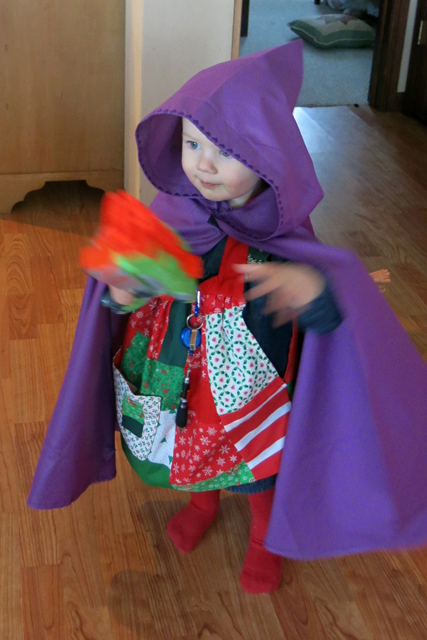 quilt | life with three boys and a splash of purple! 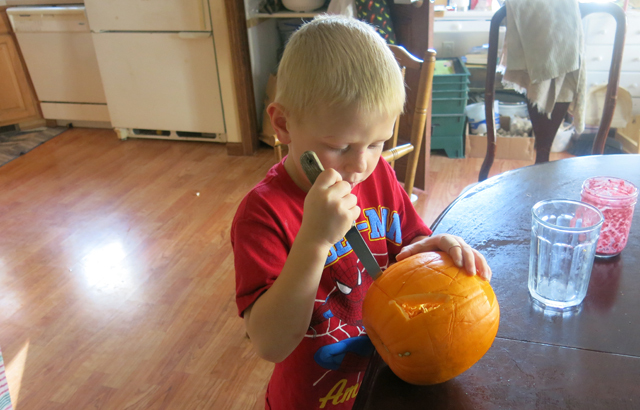 I started out this month posting about Henry’s Pumpkin, click here to see that post. We don’t give many gifts or big gifts or have a huge party. During the last year I have been not planning parties where we have many friends over. Since our family grew to four kids, birthdays needed to be simplified. Our family celebrates birthdays in a very simple way…we do special things – you pick your favorite dinner meal and dessert, you invite a friend to do something fun with us around your birthday time and we do something fun as a family. 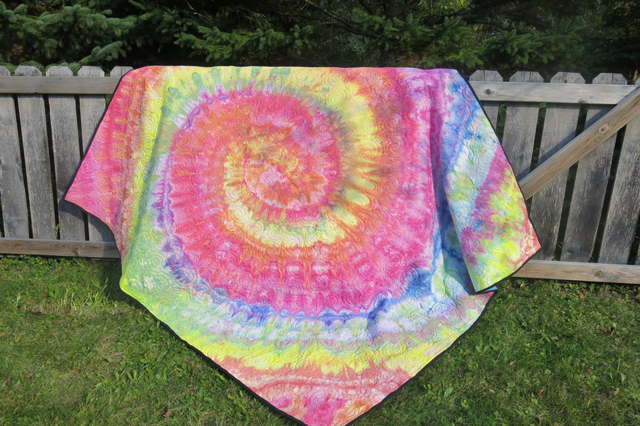 I dyed a sheet for Robbie this summer with the intentions of having it made into a quilt. Robbie helped me pick out the colors of the rainbow to use. I loved that idea! He doesn’t know that he is my “rainbow baby”. I hired to have it machine quilted and it was finished just a few days before his birthday. 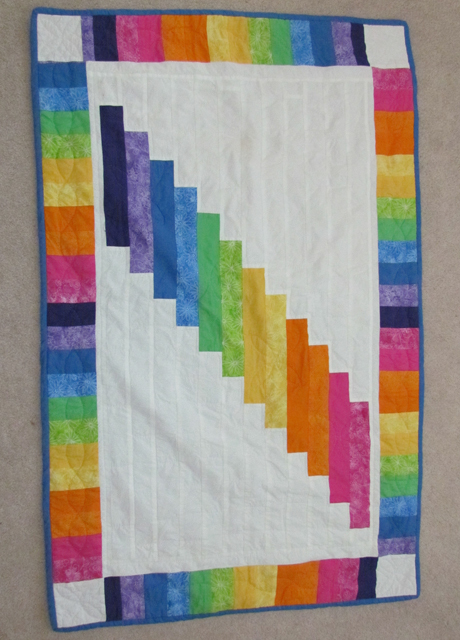 I started this quilt in February after learning that my cousin would be having her “rainbow baby” in September. I finished it the last week of October and gave it to her on October 31st! 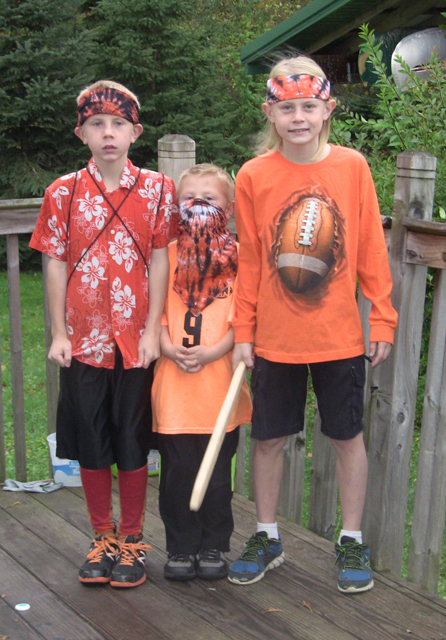 Homecoming week at Iola means the school has an Orange and Black day. I dyed their bandanas for this occasion and I expect they will get a lot of use out of them. 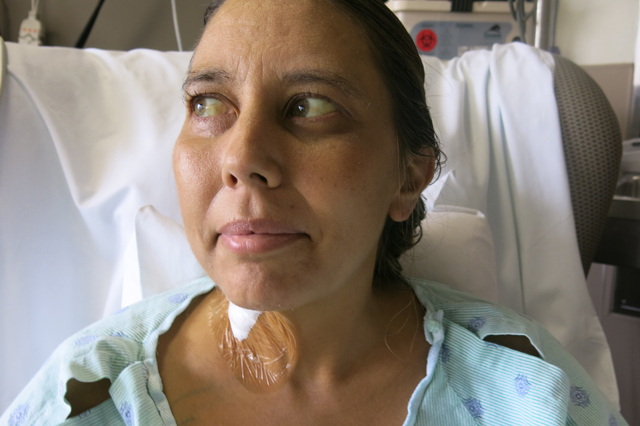 My sister Emily had her liver transplant in September. I posted two posts around the time of her transplant. 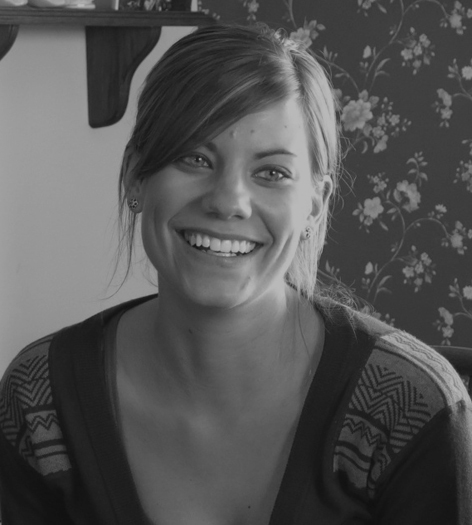 A Prayer for Emily and A Sister’s Emotions. She came home in October. I have saved these before pictures to share an after picture at the same time. This is the week she was in the hospital before her transplant. 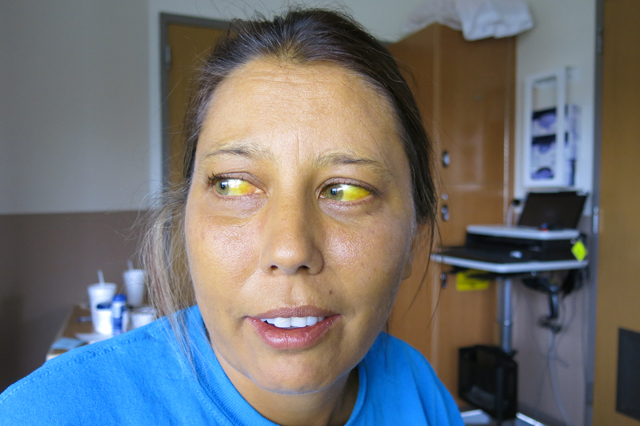 She was very jaundice, I believe her bilirubin levels hit and all time high of 40 the week this picture was taken. 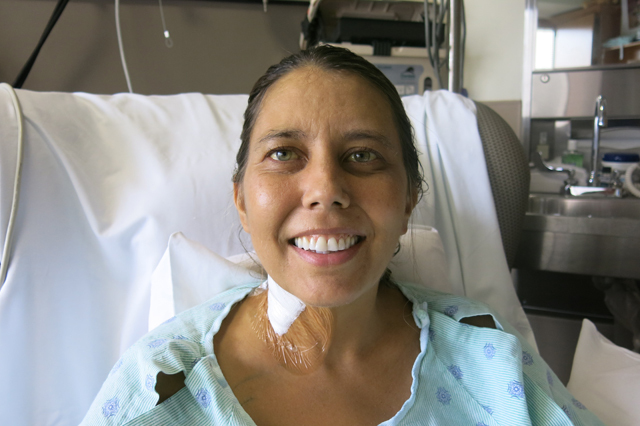 I went to visit her and was pleased to see a smile on her face and she her in good spirits. 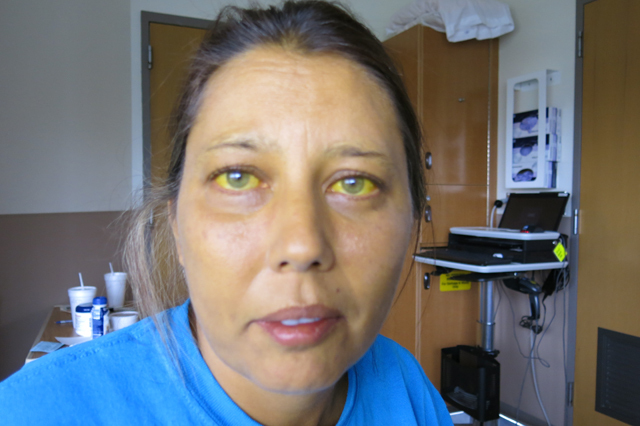 What else can you do when the doctor says, “You are not going home until you have a transplant.” When I sat down next to her bed with the hospital window at my back I was shocked to see how yellow the whites of her eyes were and her skin color compared to John’s was also shocking. 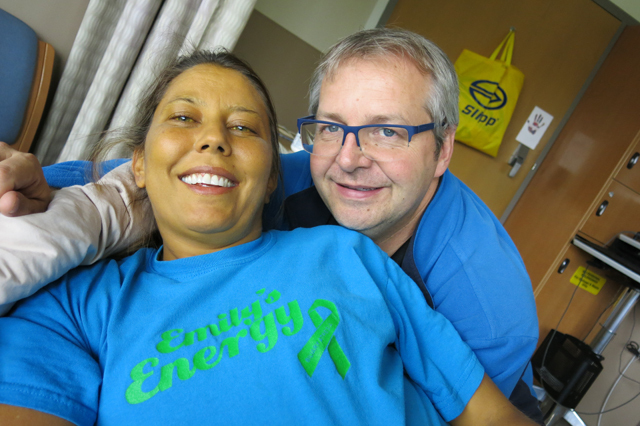 Emily is home, recovering and getting stronger every day. She told me she has lost a lot of weight since her transplant and looks very healthy. Drinks! I have a few favorite drinks. I love coffee the most. All kinds of coffee! I also love beer, but don’t get to drink that very often. Jack’s mom went to Finland, over a year ago (? 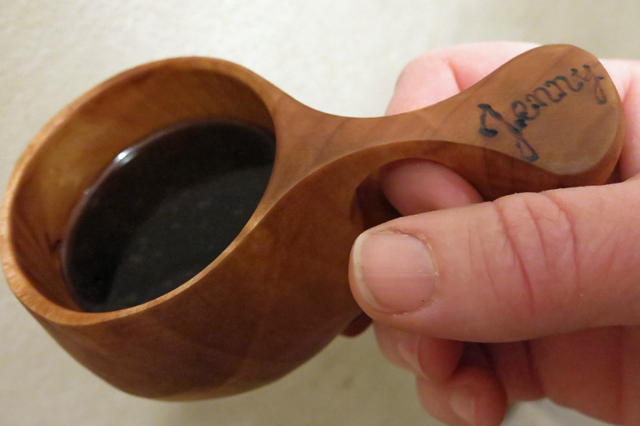 ), and brought a pair of Kuksa (Finnish drinking cups) for us. 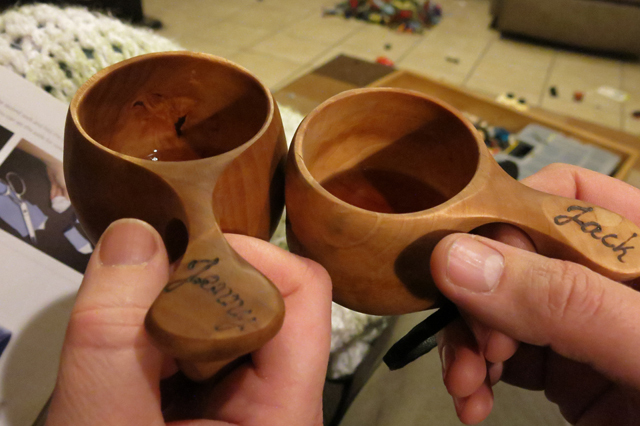 We finally sat down next to each other on the couch and broke in our cups drinking Four Roses Single Barrel. I also have to share a new find for me – a local coffee roaster is here in my area. I had no idea! 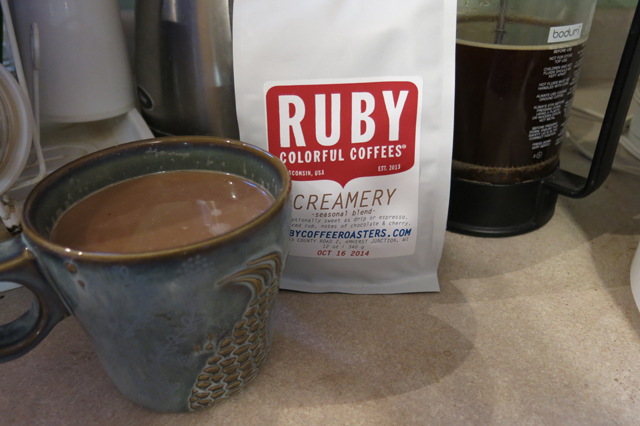 Here is the link to the article where I learned of them, “Ruby Coffee Roasters sees business perk up”. I also like to make and drink smoothies. My best friend in college, Bethany, first introduced me to smoothies. One day I made the mistake of prepping the blender with the smoothie ingredients and not blending it until after the boys got home. 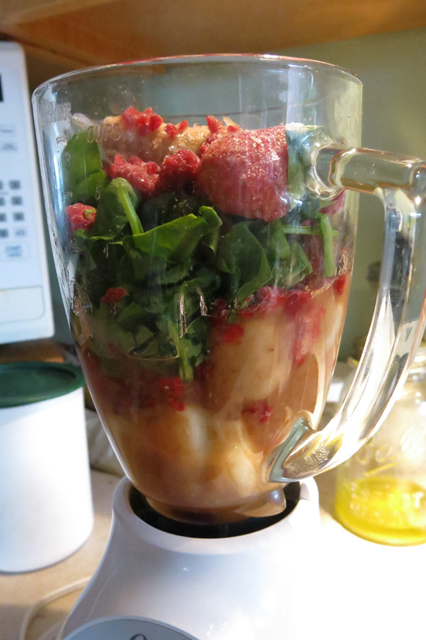 When Robbie saw the blender before the blending happened he scrunched up his nose and said, “what is that going to be?”. He didn’t drink my smoothie that day. 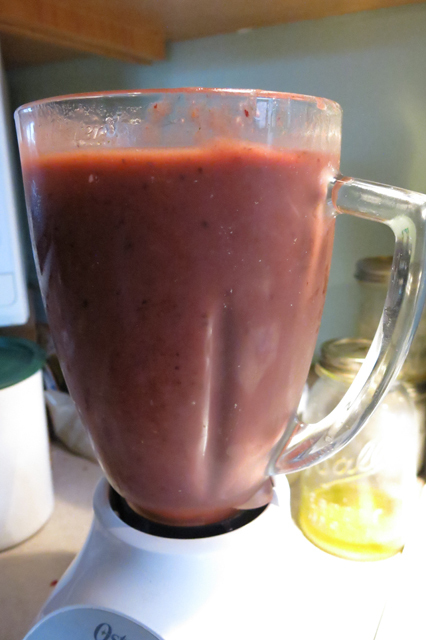 If he only knew that every day the before blending looks the same, he probably wouldn’t drink my smoothies. Charlie has begged me for jobs that he could get paid for around the house. 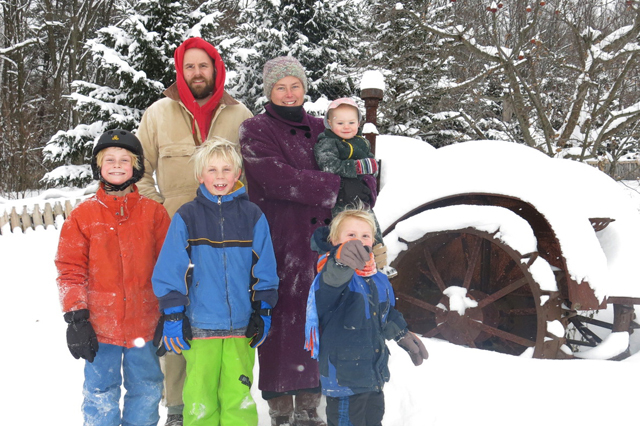 It was hard to come up with something since everyone does jobs around here for no pay, like emptying the dishwasher, feeding the dogs, taking care of chickens, sweeping and vacuuming, cleaning up rooms, making firewood, stacking and bringing in firewood. 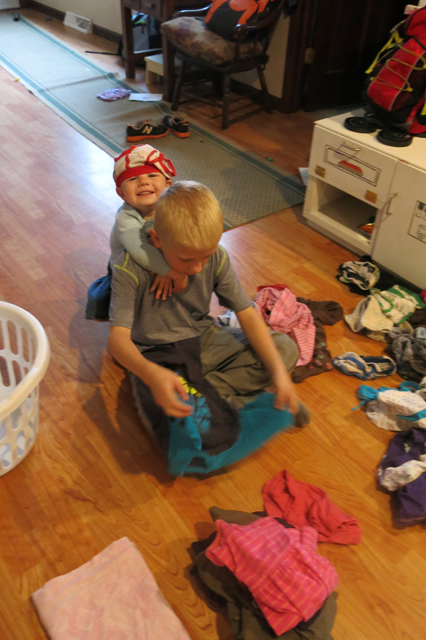 I only fold clothes when they come off the clothes line, if they come out of the dryer they get separated into each person’s own laundry basket. That is as good as it gets around here and sometimes I wonder why we have dressers. I decided folding laundry was a job I would pay to have done for the sake of it getting done and Charlie earning money. Nola Mae isn’t very helpful when it comes to folding clothes. Nola Mae loves to be measured, we’ll see if all our body measuring pays off when we go in for her well-child appointment this week and if she lets the nurse measure her. 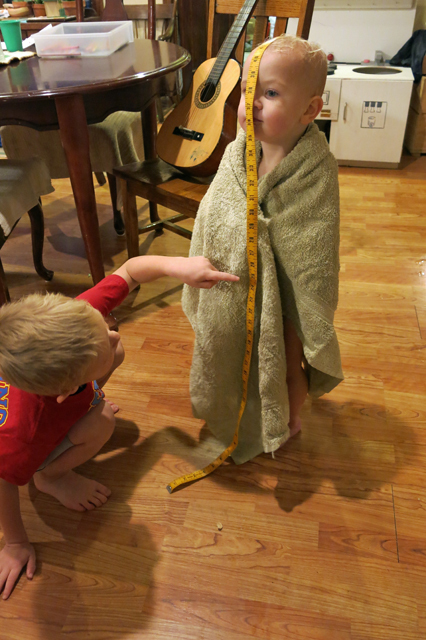 When ever she finds one of my tape measures I measure her head circumference, arms, feet, toes, legs, nose, and ears. It is a fun little game for us. After her bath she stood there for a long time so Henry could count every inch. I have worked really hard to exercise 5-6 days a week. Doesn’t always happen that many times in a week, but is my goal! I had recently organized our basement and got my Nordic Track out in the open for when there was a day I had time to get on it and do it. 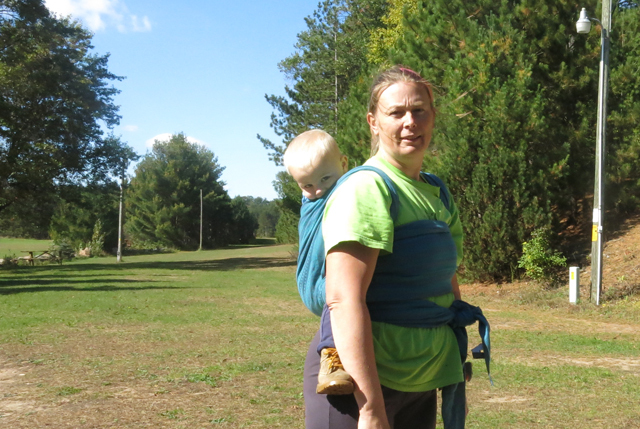 One day it was windy and too yucky to run outside and I was too lazy to drive to the ski hill to hike on the trails. I was wishing it was winter because skiing on a day like that would have been fine. So I climbed on the Nordic Track and skied for an hour. I had a great workout and imagined I was skiing. 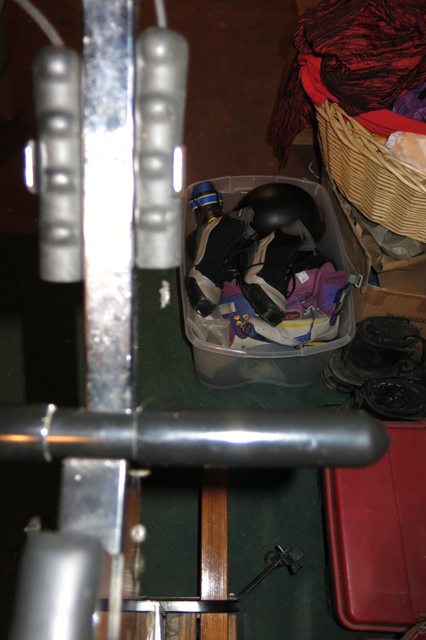 I thought it was funny that our box of ski boots just happened to be right there in my face. I couldn’t decide if that made it helpful to imagine skiing or painful because I wasn’t skiing on real snow. Our school had a day off on a Friday this month. 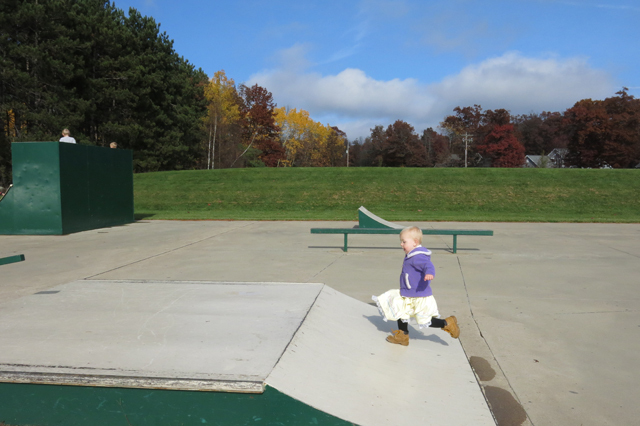 I figured going to the skate board park in Waupaca would be a good idea because we would have the park all to ourselves. Charlie had fun riding his bike. 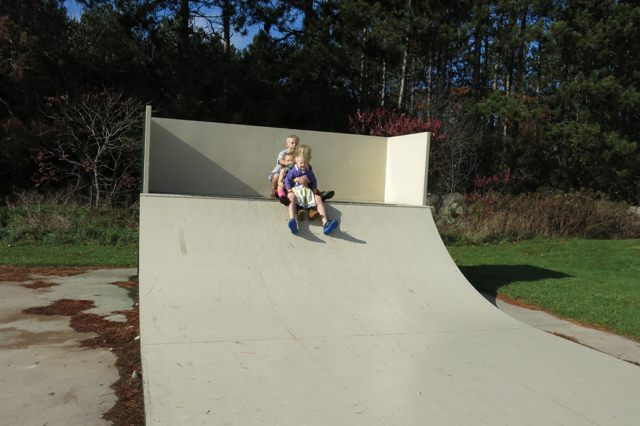 And everyone had fun sliding. Nola Mae ran all over the place and tired herself out! Swan Park also has a very nice hiking trail. We went on the trail through the woods and Nola Mae got a little nap. Robbie was in charge of the camera. Instead of trick or treating I bought each boy a bag of their favorite candy and we stayed home. 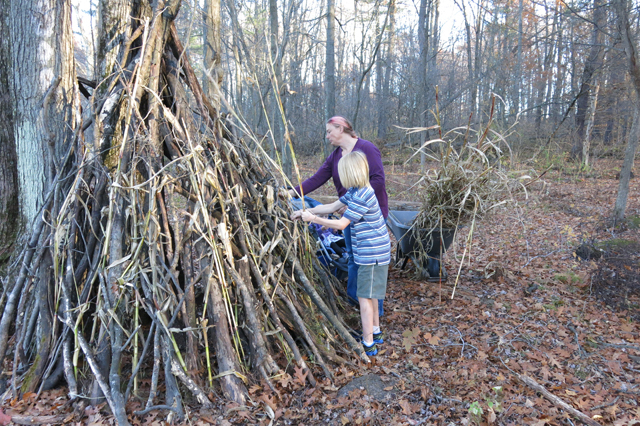 We had a good time in the woods making improvements to their forts. And they had a fun game of 500. 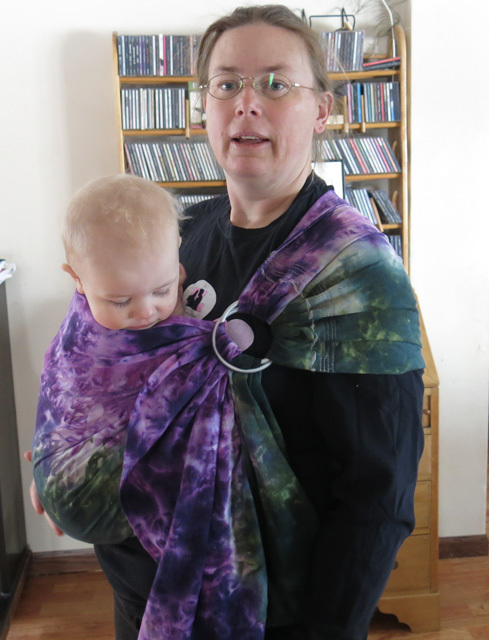 I slingafied the other half of my friend’s woven wrap Winter Lilies. I took the boys and Jack to the ski hill to show them the new trail and Jack took this cool picture of Nola Mae waiting to be wrapped. And this one when we were done wrapping. 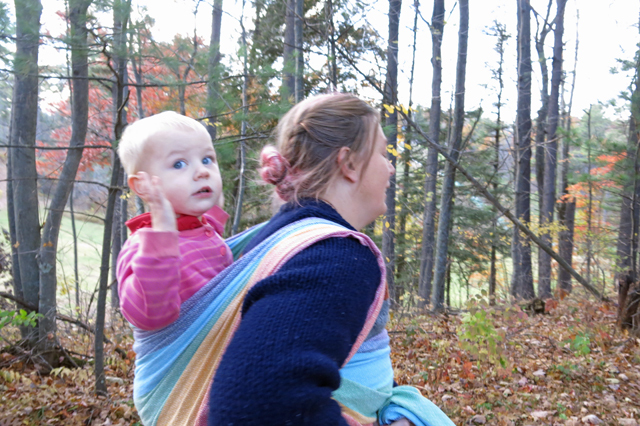 Double Hammock Carry with my Ellevill Norwegian Jack wool woven wrap. 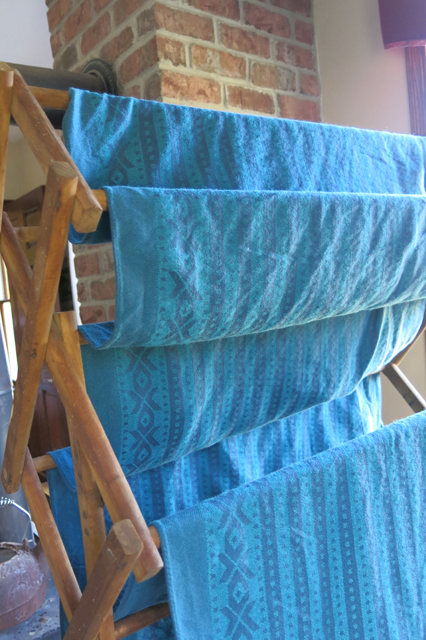 Wool wraps are tricky to wash. I wanted to wash it to soften it up a little more, and it worked! I had to take a photo of how pretty it looked on the drying rack. 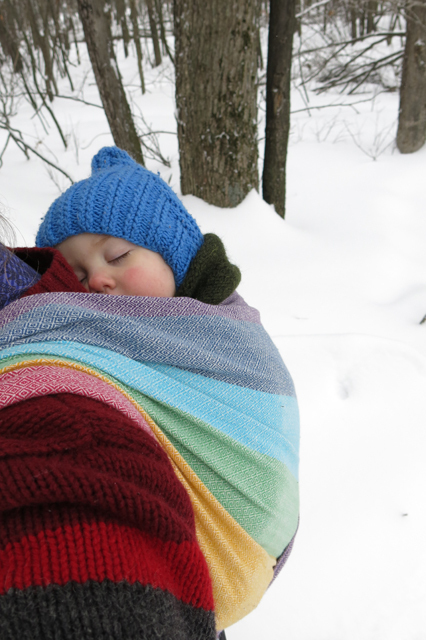 It is a beautiful wrap! Swan Park nap in my woven wrap Ellevill Zara Velvet. 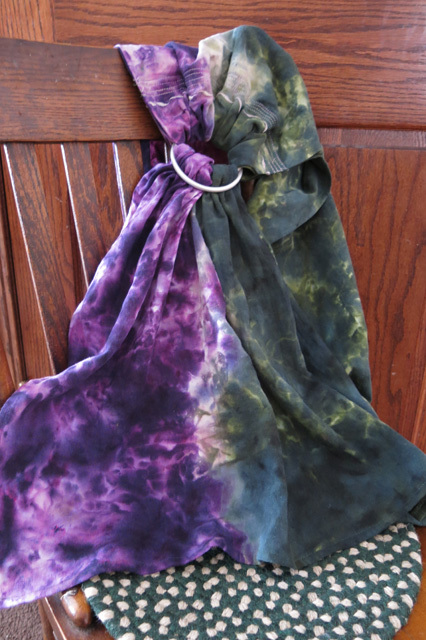 I was hoping to share my dyeing projects from September and October before this post, maybe that will be next? I finished Robbie’s quilt before he was born. 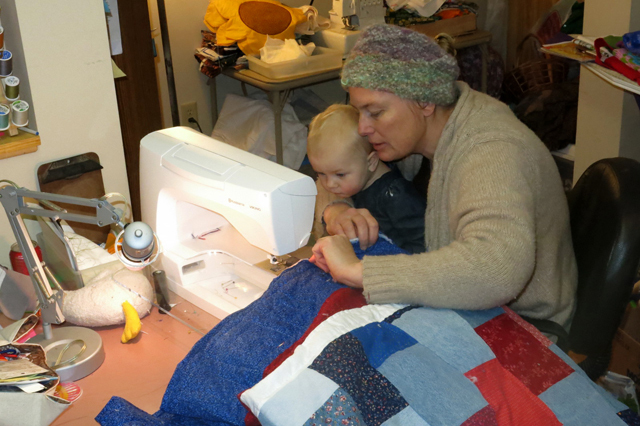 Charlie’s quilt was started before he was born and finished by his 2nd birthday. I used the same yellow, blue and pink fabric as Robbie’s quilt. 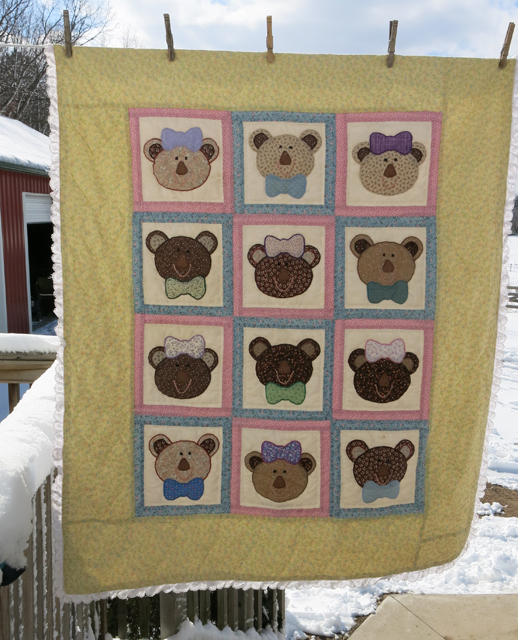 The bears are a collection of browns from my stash, my mom’s, my grandma’s and my mother-in-law’s fabric stashes. The lace was added because when I nursed Charlie to sleep in my bed he always found the lace on the quilt my mom made me and held it in his has even after he was sleeping. Henry’s quilt is my least favorite out of the four. 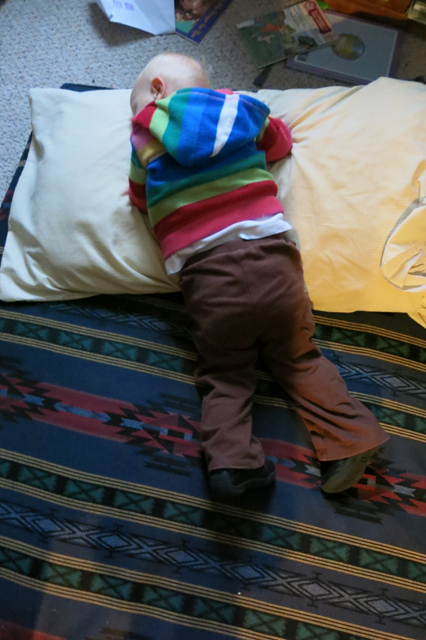 I was in a rut when it was time to plan his quilt. 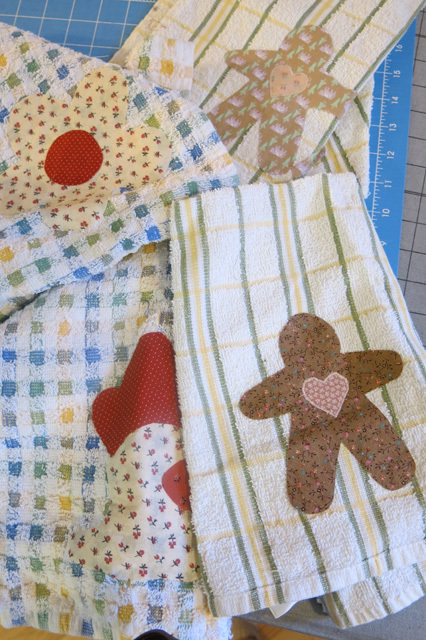 I wanted to keep the pattern going by using the same fabrics as I did with Robbie and Charlie’s quilts. I wasn’t able to find one of the prints. 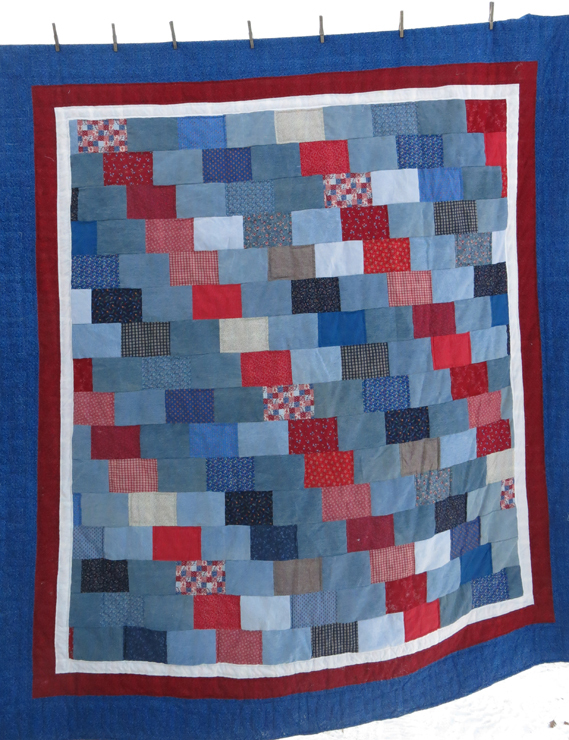 So I took the reds and blues that I have collected over the years for Jack’s denim quilt that I made and did a “crazy cut” design for the border. 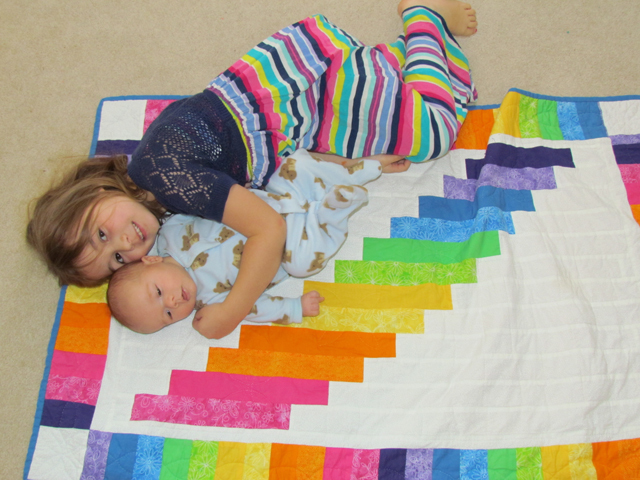 Nola Mae’s quilt was started after she was born. I found this idea before she was born. If she was a boy these bears would have had shorts and a shirt on. 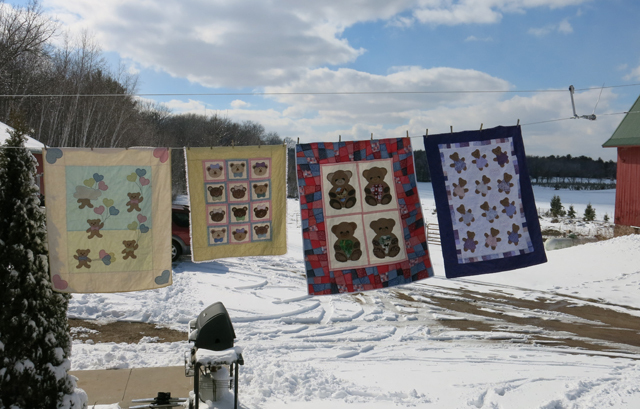 All four quilts are machine appliquéd and hand quilted by me. 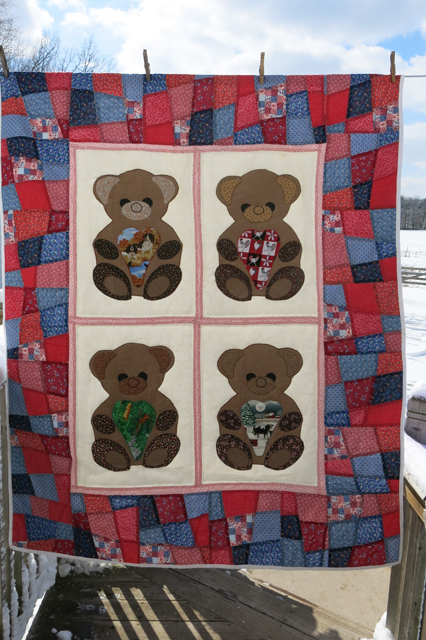 All four quilts also have a heart on them, Robbie’s balloon, the quilting in the border on Charlie’s, Henry’s bears’ have a heart, and the quilting on Nola Mae’s. They were all fun to make. UFO = Unfinished Objects that I have lying around. I need this list organized to prioritize my “UFO to finish”. It will help me to be prepared to grab a small project when I have a long car ride ahead of me or when I am looking for something to do (that doesn’t involve cleaning) while Nola Mae is napping. 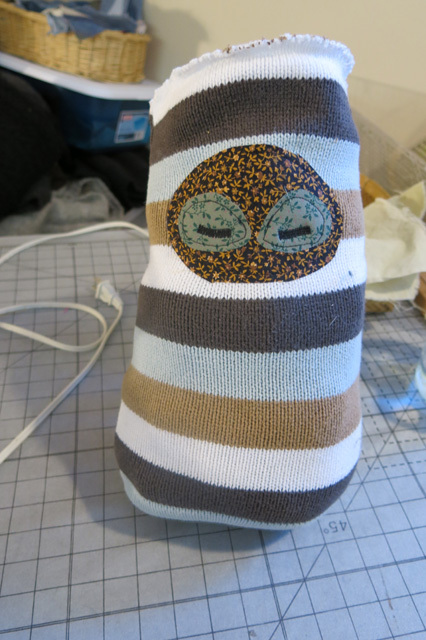 Part 1 = I know I will start more projects and not finish them. 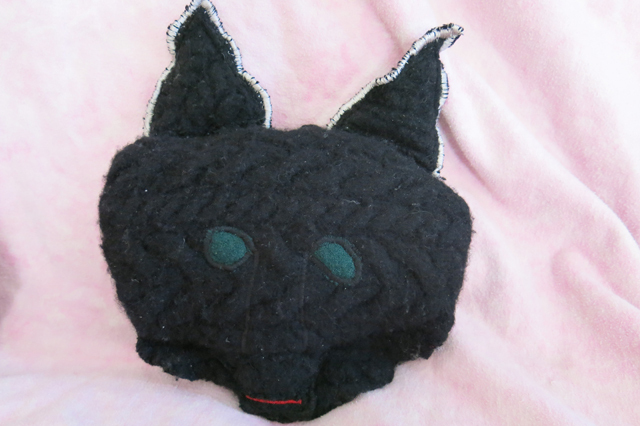 Or I may find more UFOs as I do more organizing in my sewing room. 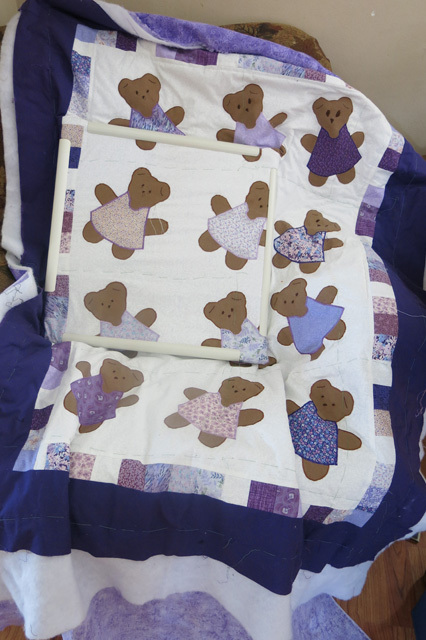 Finish hand quilting Nola Mae’s bear quilt by her birthday. 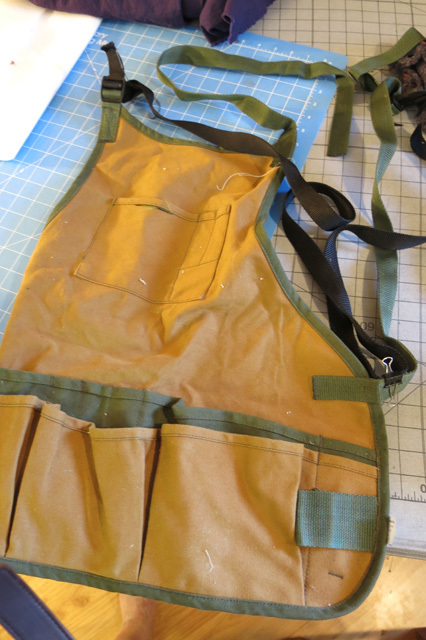 Jack wants a different kind of strap for his workshop apron. 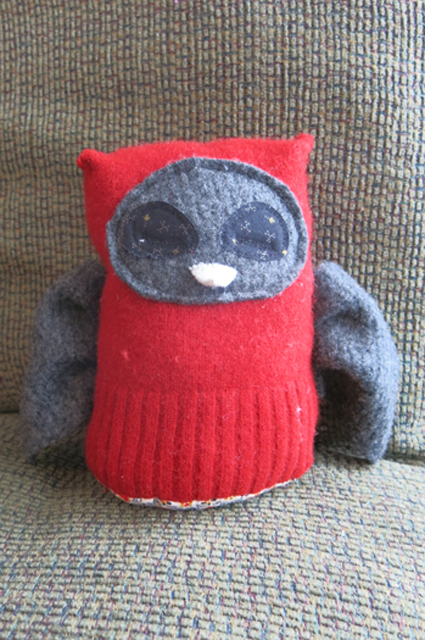 These are the sweater owls that need to get done before I cut or felt anymore sweaters. I started this start baby for my youngest nephew, shortly after he was born (14 months ago). I am not sure how old these unfinished dish towels are. 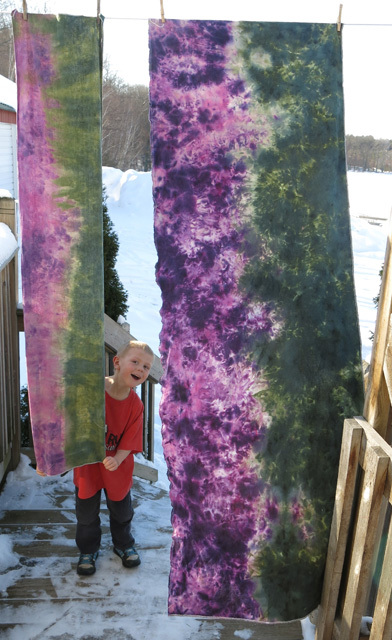 Here is a Shibori dye project in amazon green on muslin fabric that flopped! I am going to try one more time with an over dye same method but with a different color. I am waiting some color inspiration and the right day to get this done. 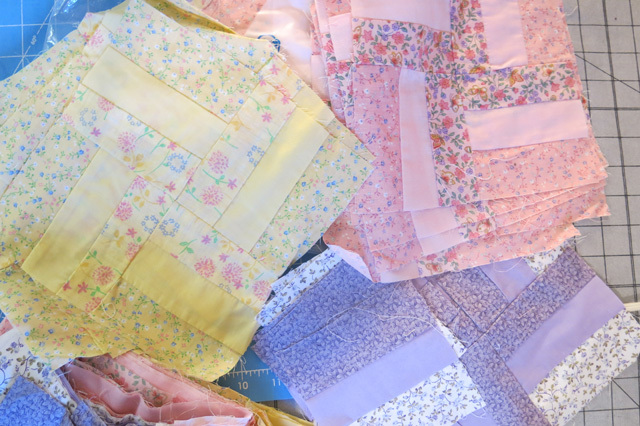 My plan is to make these 12 in squares into a lap quilt. 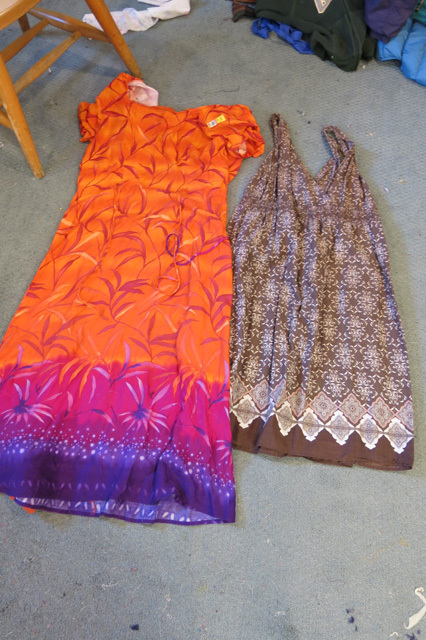 Two dresses that I want to turn make into summer skirts for myself. 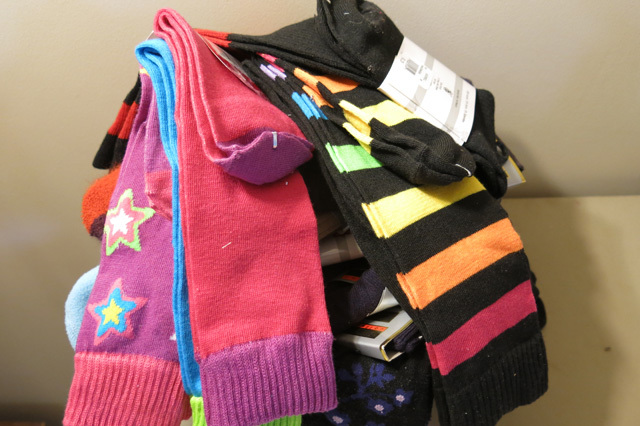 Colorful socks made into baby leggings. 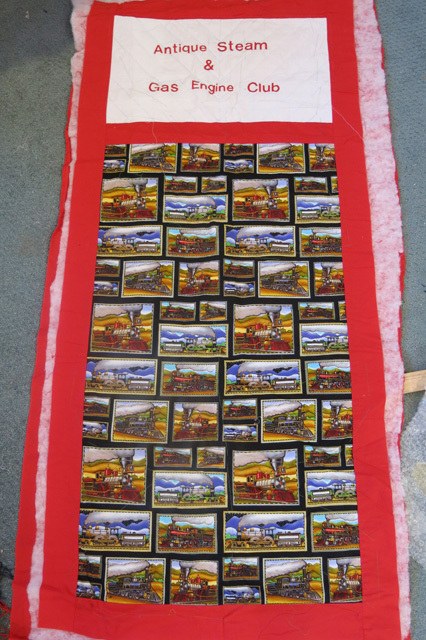 Finish hand quilting this wall hanging to display Jack’s and his Dad’s buttons from the steam show. I would love to have this scrap quilt finished this year. Every time I get it out Nola Mae wants to rearrange the squares. I started this in the winter of 2011-12. These are leftover squares from a quilt I made a friend over 10 years ago. 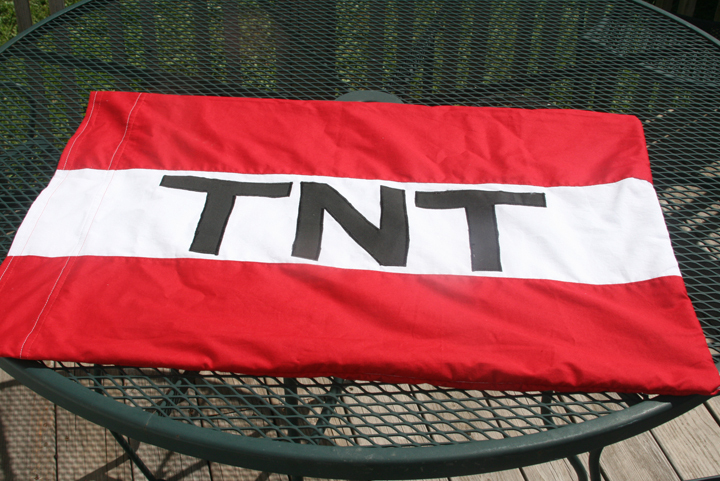 I cut and sewed extra to make another one. 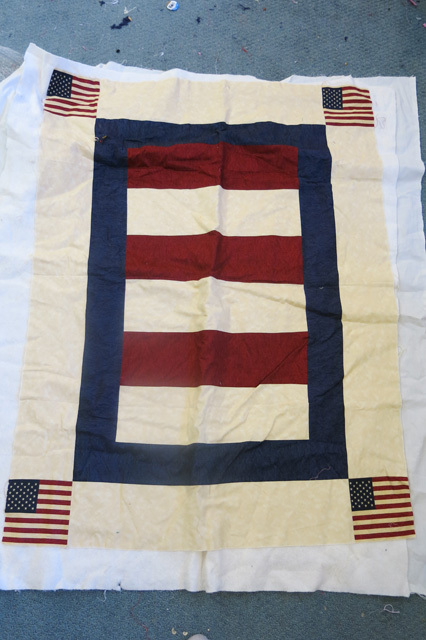 I found this simple quilt top at Goodwill and would like to baste it and make this my first machine quilting project. 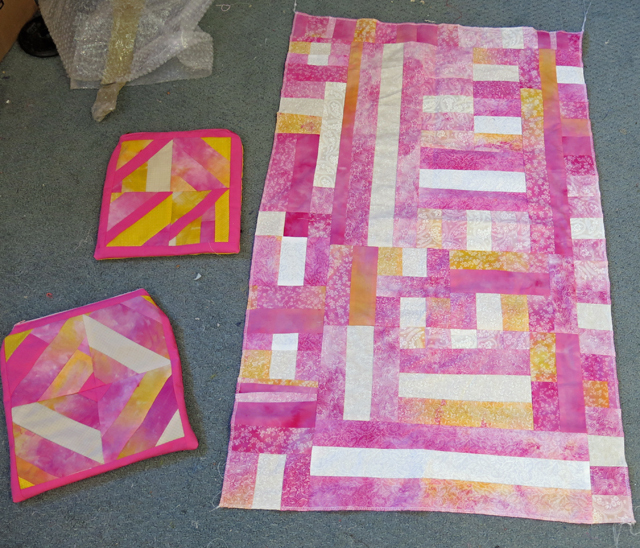 A dyed project from February that I would like to make into a quilt. 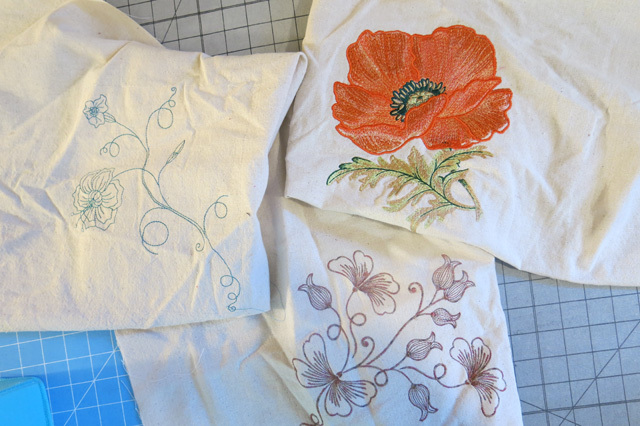 I machine embroidered these flower designs on “bag” fabric. The design on the left was a test run for my ring slings and the design that I decided to put on the tails of my ring slings, it takes about 15 minutes to do. The bottom one was another test run for the ring slings. It didn’t make the cut because it takes about 40 minutes. The orange poppy was going to be made into a bag, but the stitching pattern got misaligned somehow during the last color and last 5 minutes of the 5 hour project. I couldn’t throw it away! 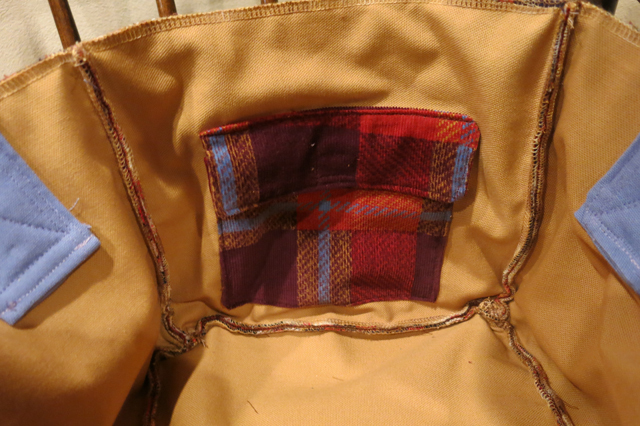 Recently, I filled in the lines manually, which took me about 15 minutes and now it is ready to be made into a bag. 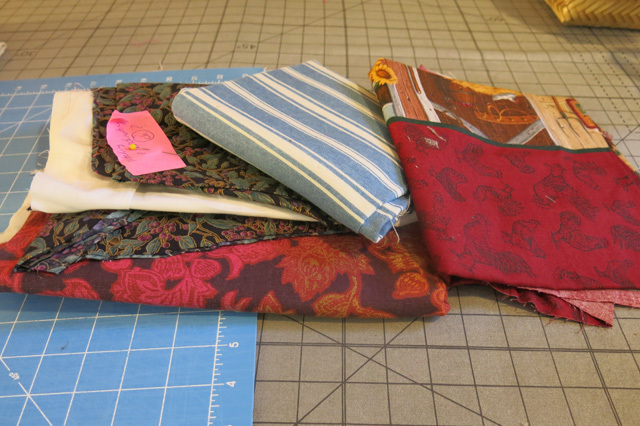 These four are aprons cut and ready for sewing. 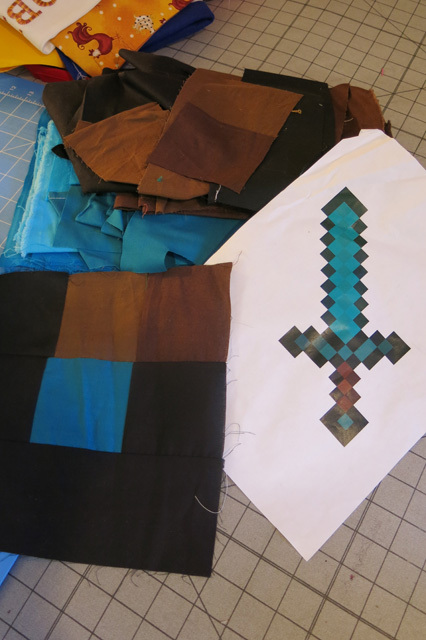 Robbie and I started this minecraft ice sword design last summer. I am not sure when we will get this done and what it will made into. These are two older projects that Robbie and I started, maybe in the winter of 2011-12. 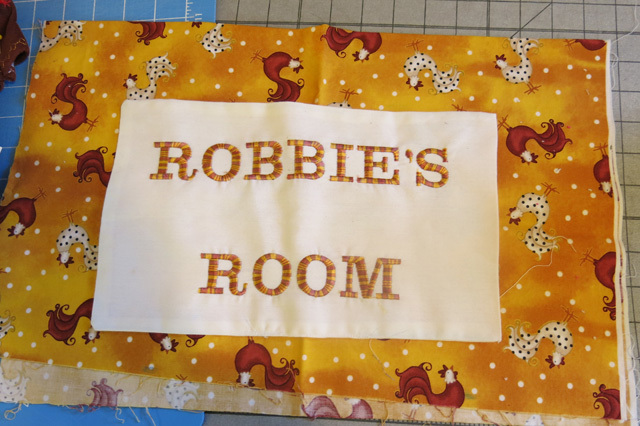 Originally, Robbie wanted “Robbie’s Room” to be a sign on his door. I was trying to think of something more practical, like a pillow for his bed. I don’t think we ever decided – one reason it never got finished. This isn’t really a UFO, but it is my mending pile. I got this blog post idea from my friend Meredith. 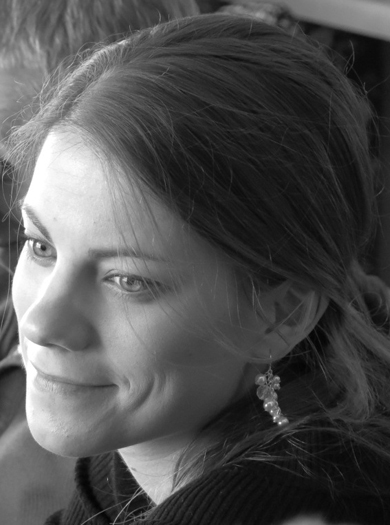 She wrote a blog post called UFO Spotting, click here to see her beautiful unfinished objects. I have had a busy month. I am pleased with the amount of things we (I) did and the things we caught on camera, considering it was a short month. Nola Mae loves to play in the water. I am expecting to have lots of fun this summer at the beach. Whenever she hears the water running in the kitchen she comes running and yelling “bubbas” and lately she has spent time in the bath tub. She is making up for the lack of baths she had during her first year of life. Every time I tried to give her a bath she would scream. 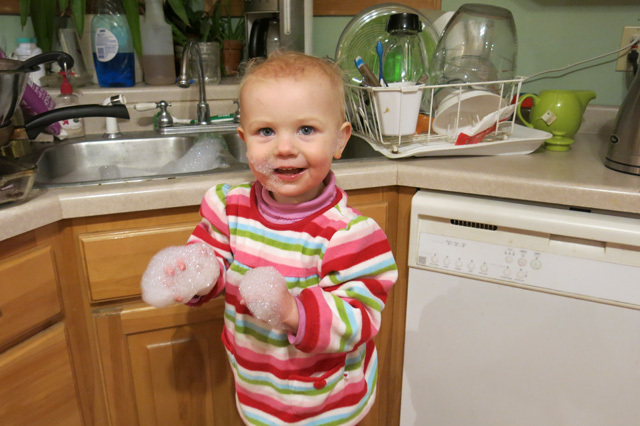 I don’t really care for extra messes around our house, but when this sweet girl is loving the bubbles I can’t resist. 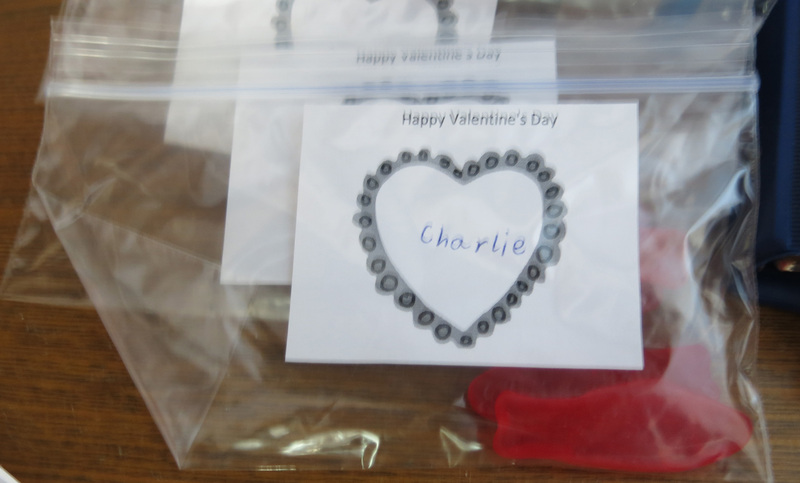 My friend, at Kissing Glue, shared a few awesome valentine ideas that she has done in the past that inspired me to do this with our boys. We don’t celebrate anything in a big way, ever, especially on Valentine’s Day. I am okay with that! 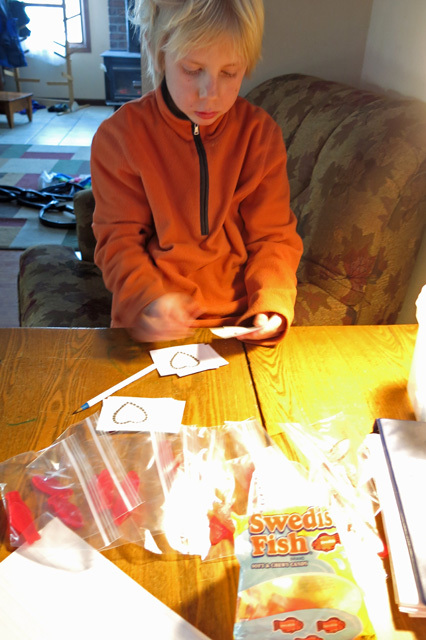 My Valentine wrote me a sweet letter with all the things he appreciates I do, and he didn’t miss a single thing! My letter is definitely a keeper to dig out on a rough day! He also made me a drink, one of my favorites, that I haven’t had in a very long time! 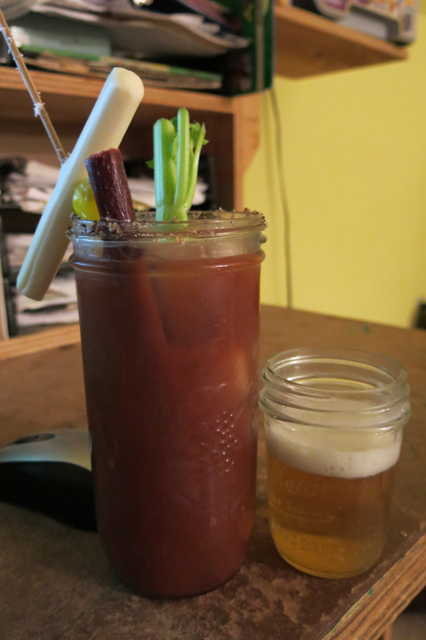 I sure do miss Rusty’s Backwater Salon’s bloody Mary’s! We had a little excitement this month with Charlie. 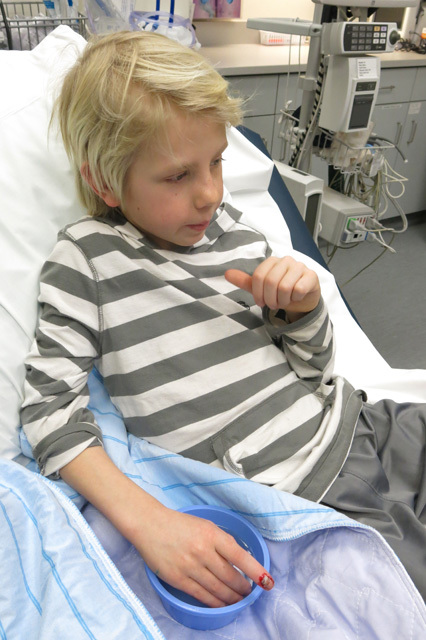 I wrote a blog post about Charlie’s emergency visit, click here to read that post. Someone left the door open and Nola Mae followed. Her hair is starting to come. I knew it would arrive sometime because I was a bald child until I was two. 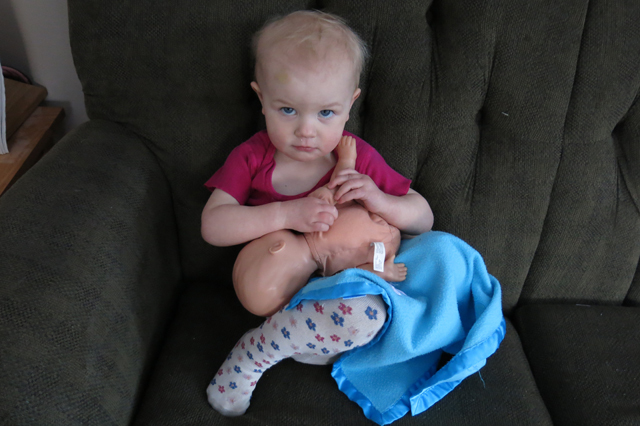 Nola Mae nursed her baby doll for the first time this month. She also has read books to her babies! 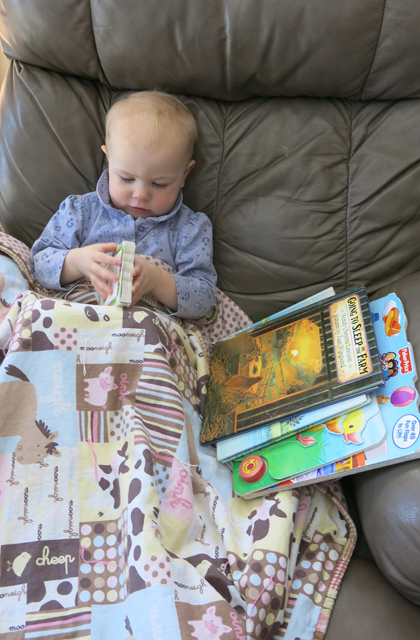 I am proud to say everyone in our house likes to read books. Nola Mae hasn’t shown much interest until recently. Henry and I read books often and she plays in the room and sometimes comes to sit on my lap to look at one or two pages at a time. 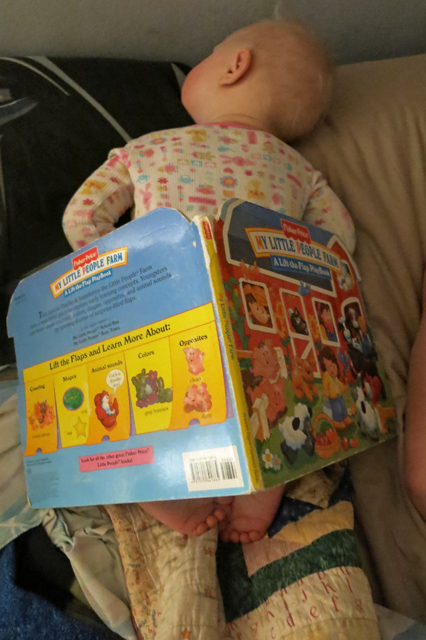 She recently has started to bring me books to read to her and even sits in my lap for the entire book! Last week she kept bringing me books, we read these five twice in one sitting. And then she sat there for another 10 minutes reading them by herself. Pointy hood, heart booty, cutie pie! 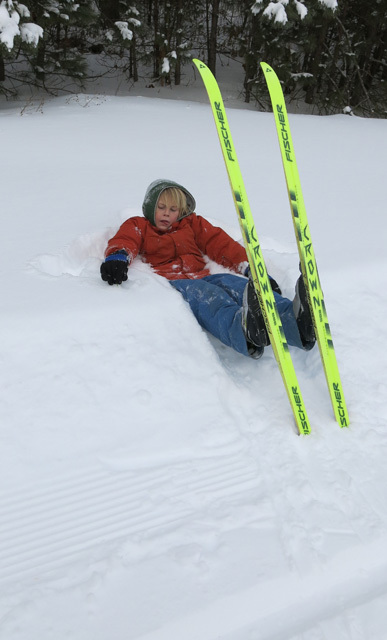 If this girl could ski every day she would be happy. 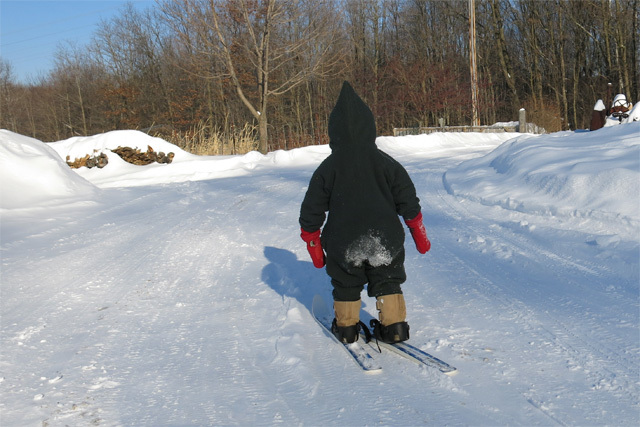 Everyday, she says, “kiing” and puts on someone’s skiing helmet or boots or plays in the skiing sled when I have it in the house. 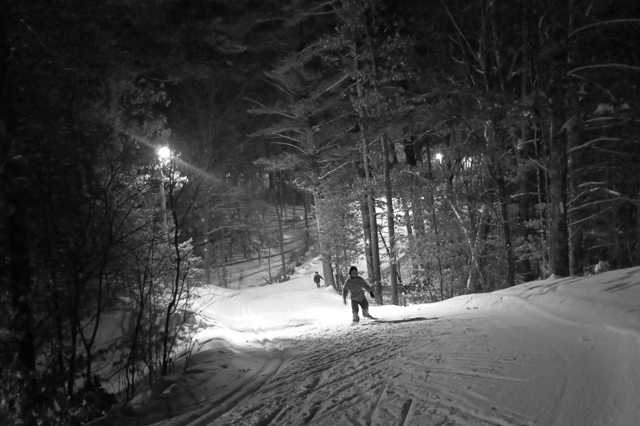 I wrote this post this month with photos from one of our snowshoe outings. 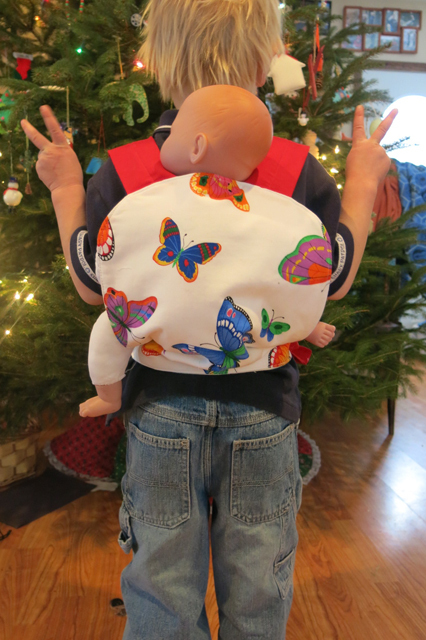 Lately I have been thinking, “I don’t remember the last time I wrapped Henry.” I was feeling kind of sad thinking that there may not be another time, since he will be 5 in one month. 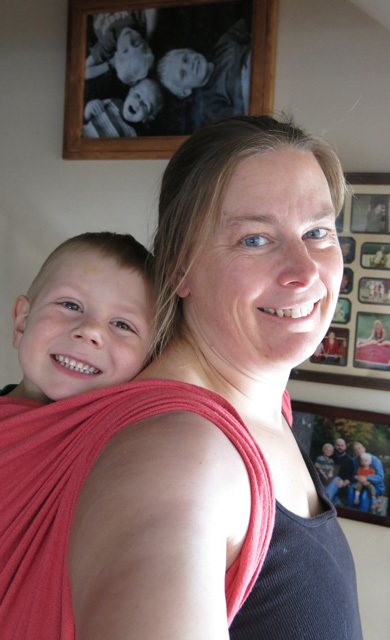 Then he got hurt in the toy room, dug out my wrap and brought it to me and asked to go on my back until he felt better. He was up there for about 10 minutes and was happy to take a picture so we can remember this moment. This could actually go in March’s monthly post because it will be finished in March. But I started this rainbow ice dye on February 28th. 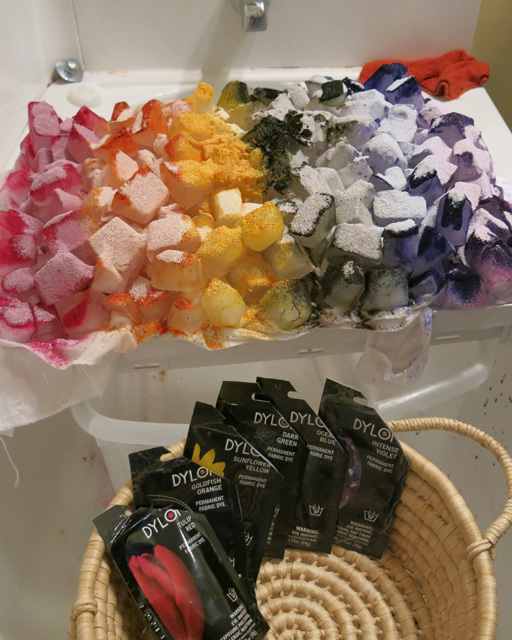 My collection of dye projects is growing and I may get a “dyeing project” blog posts done in March and include the finished projects from this dye session. 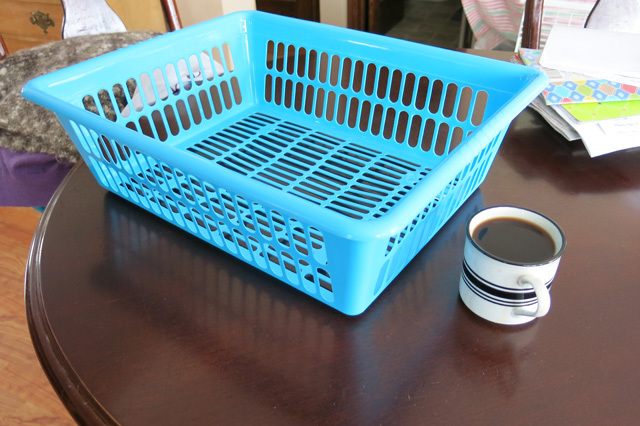 I bought this basket for ice dyeing, $2.49 at Goodwill. I will need to test it out soon. I couldn’t use it for my rainbow project because I needed a bigger surface. I struggle every time to stack the ice or snow high enough and I think the sides on this basket will help solve that problem. 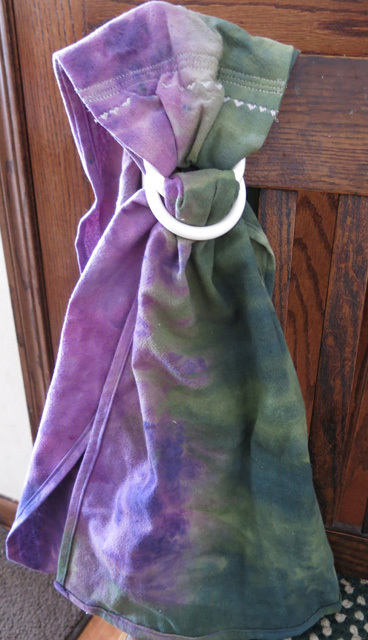 I used these scraps of fabric that I ice dyed last month to sew these zipper bags and this panel of fabric that may turn into a baby quilt or a tote bag. 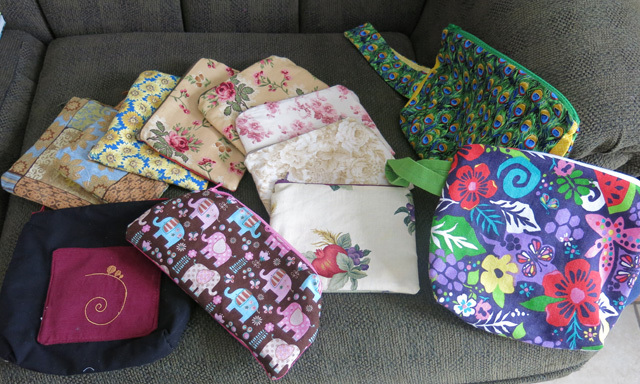 While I was making zipper bags I dug out my bag of unfinished zipper bags. 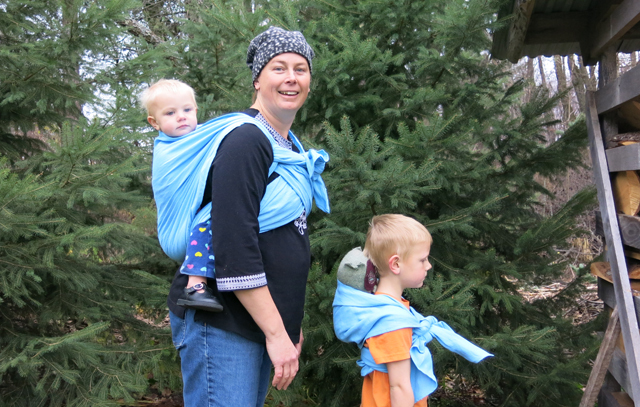 The three ring slings I made this month. 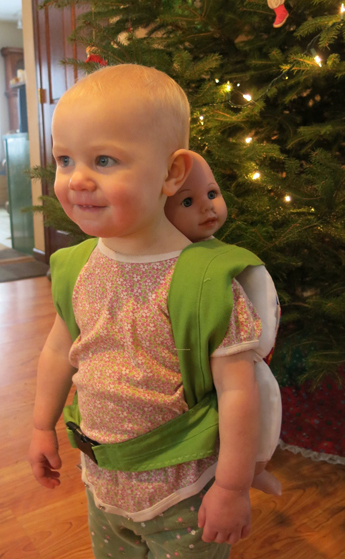 The last one is for a child to carry a doll and strong enough for an older sibling to carry a real baby. I wore this sweater last winter. 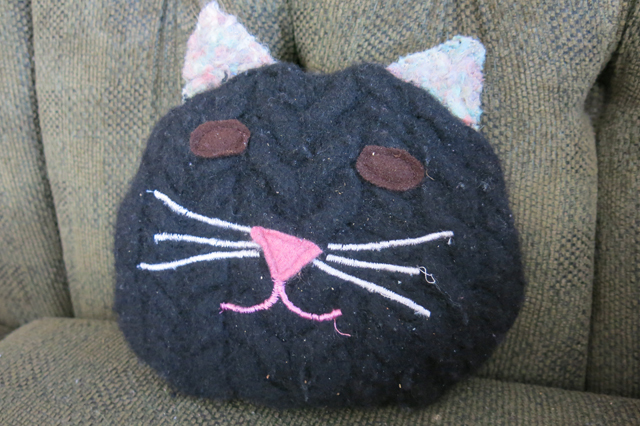 It slowly shrunk on me and so I felted it to make a stuffed fish. Wouldn’t it make a cute fish? 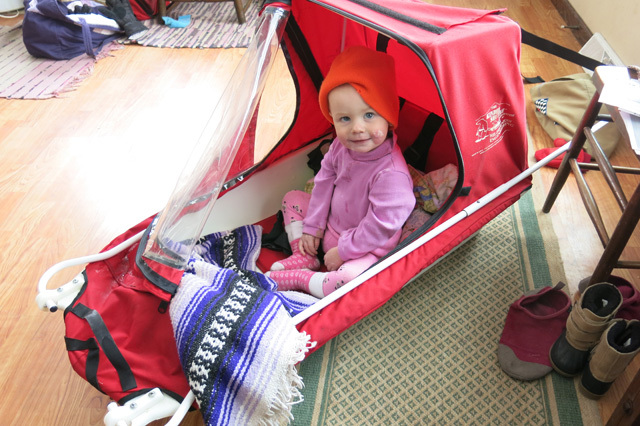 Well, it fit Nola Mae perfectly. 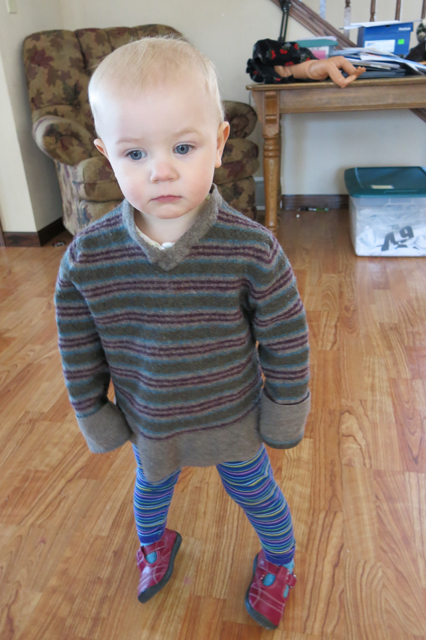 So she will wear it this winter and I will have to come up with something else to make with this wool sweater. 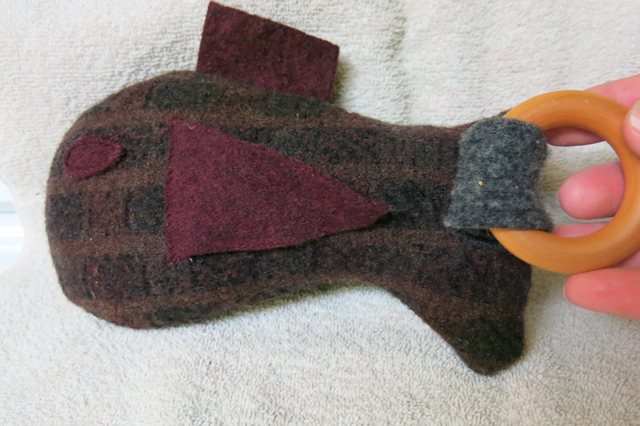 I found a different sweater for the felted wool sweater fish. The loop holding the wooden teething ring is Velcro. 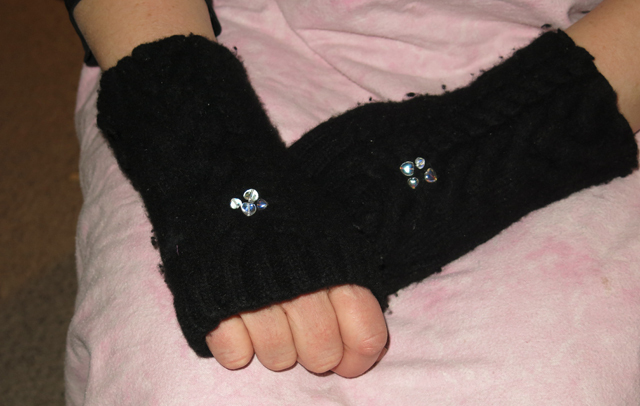 Fingerless gloves I made from a felted wool sweater. I added the four heart beads to each glove. I have great appreciation for the beautiful work my aunts and step-mom do with their jewelry making! This black sweater had a lot of love in it when it came to me. 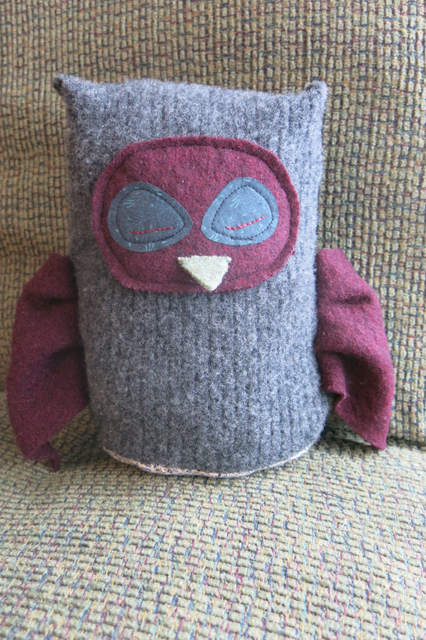 I added a little love when I made these little pillows for two sisters who miss their Daddy. Jack asked me to find a bag that would fit his shoes, a t-shirt, a small towel and a pocket for his wallet for when he goes to racquetball. 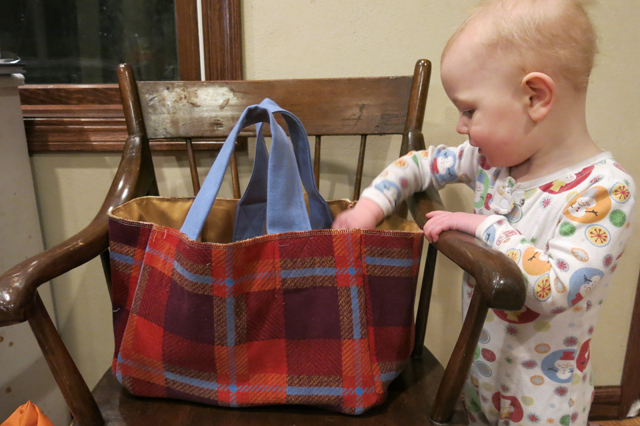 I thought it would take me awhile to find the right bag so I thought I would just make him one. It was fun, quick and easy. I didn’t buy a single thing for it. The lining fabric came from my friend, Anna. 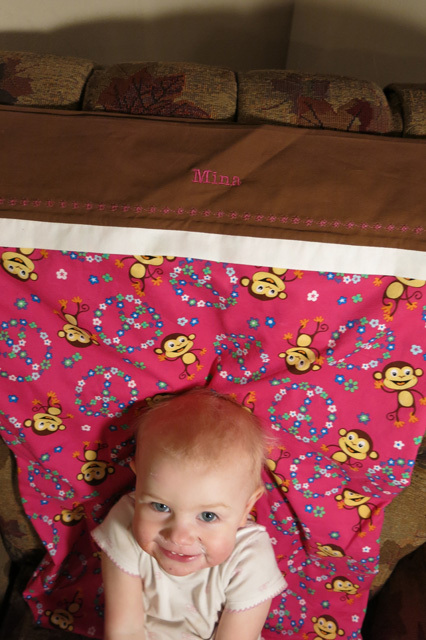 The padding and outside fabric came from my mother-in-law and the handles were the end of the strap from a Mei Tai that I made for our cousin, Jessie. I was surprised that the blue matched perfectly. I have a box of the trimming from straps of bags and aprons that I have made for this very reason! 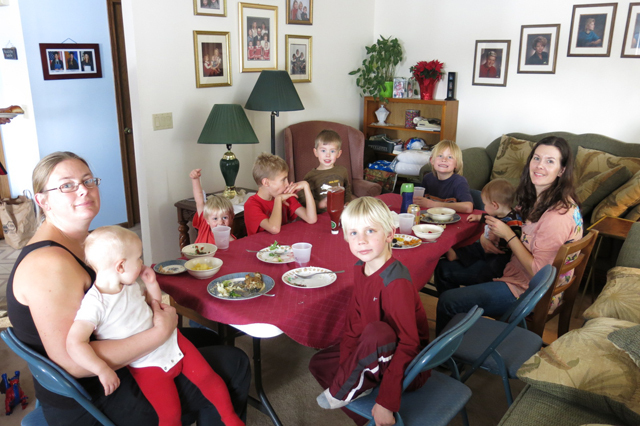 I forgot to add this one photo from our Thanksgiving meal at my mom’s. I have no idea what Henry is so excited about, it was very difficult for Jack to get all the boys looking at the same time. We are missing the two oldest grandsons in this photo. A couple of us got sick in early December. 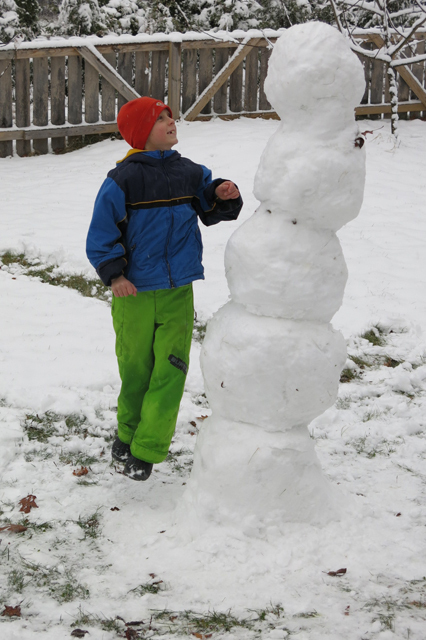 Charlie came home sick from school one day and the next day he wasn’t 100%, so he stayed home, slept in, made four snowmen in our yard and shoveled the steps for me. 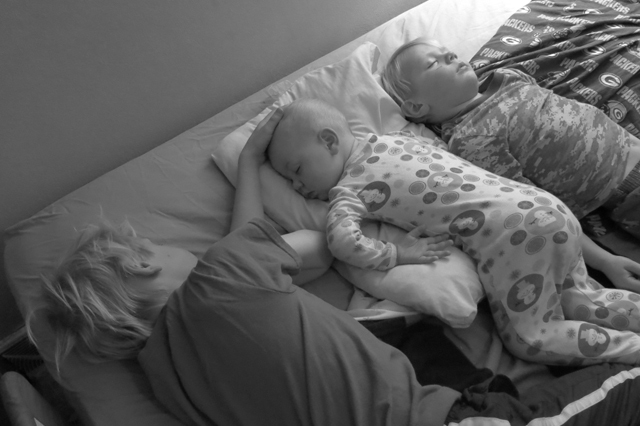 When Nola Mae was sick she walked into the boys’ room, laid down and fell asleep for a couple of hours. 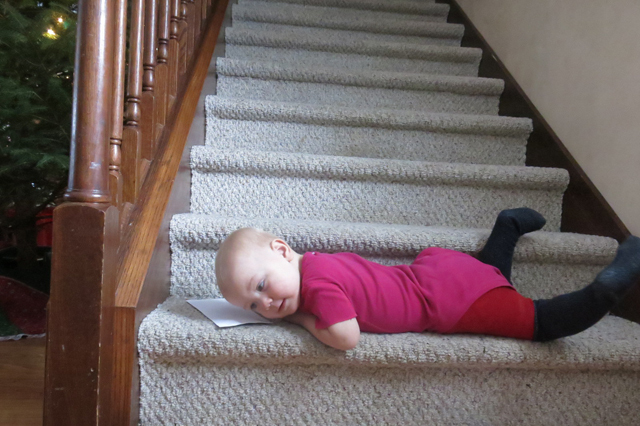 When Robbie and Henry came home from school they saw her like this and knew this was a very unusual sleeping spot for Nola Mae. She was back to her old self again the next day, coloring on her legs with markers and getting into everything. I went back to my mom’s for our cousin’s cancer benefit. All of my siblings were there. 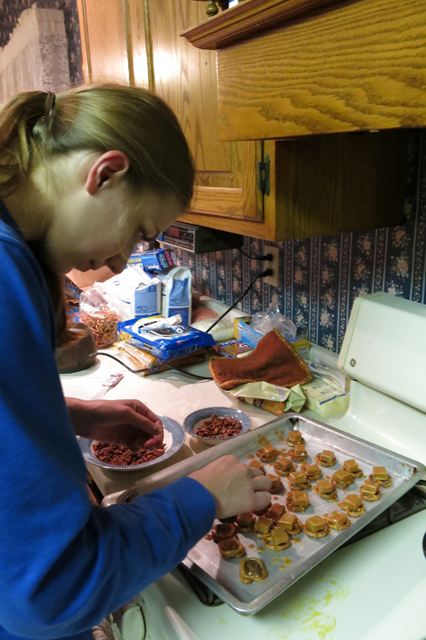 Kayla and Becca worked on Christmas candies. 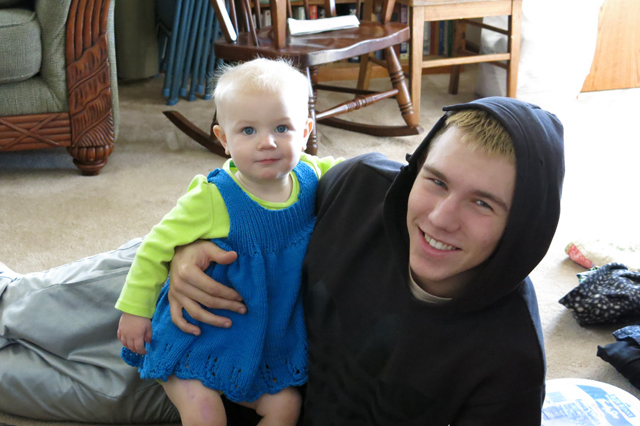 My oldest nephew, Devin, came along and Nola Mae warmed up to him very quickly. He has always been wonderful with little kids, since most of his childhood, Emily had an in-home daycare. Nola Mae missed Henry. 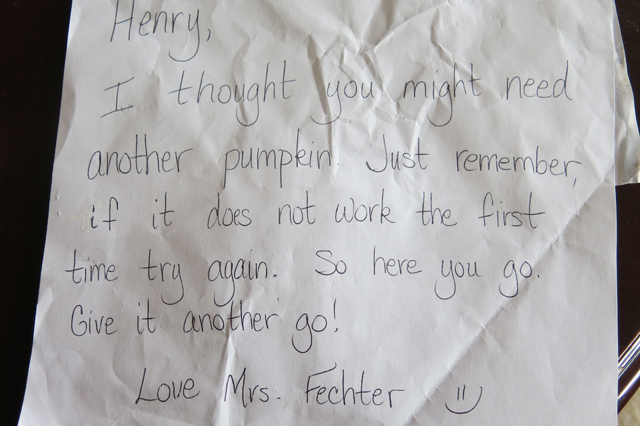 My mom has an answering machine message saved on her machine from Henry. Nola Mae listened to it often. 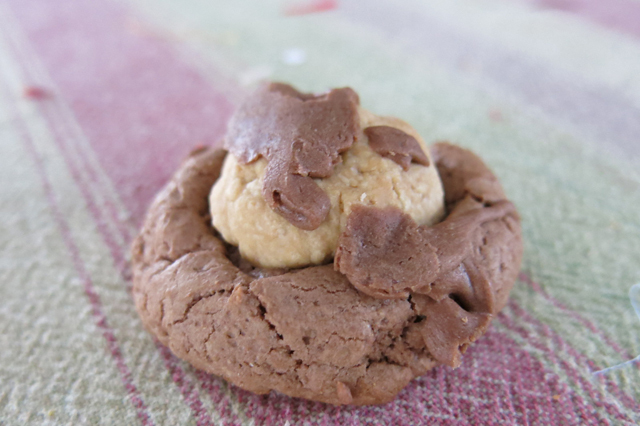 I am in search of the recipe for this Chocolate Peanut Butter cookie. Anyone know this recipe? 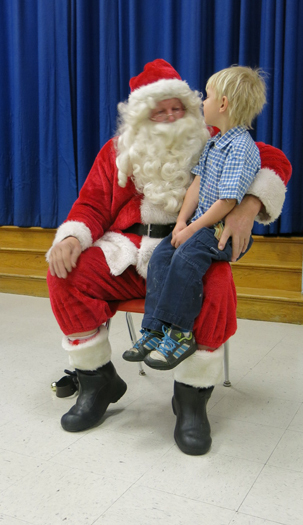 Santa came to Henry’s school for the parent outreach activity. He told Santa he wanted a robot. We traveled to my Mom’s for Christmas. We also celebrated my triplet sisters’ birthday. All three are intelligent, kind, loving, hardworking and beautiful inside and outside! 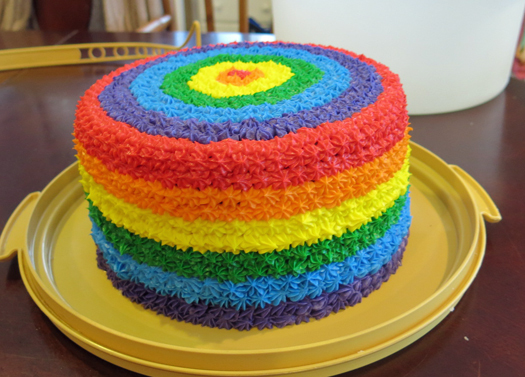 I decorated this rainbow cake for them. 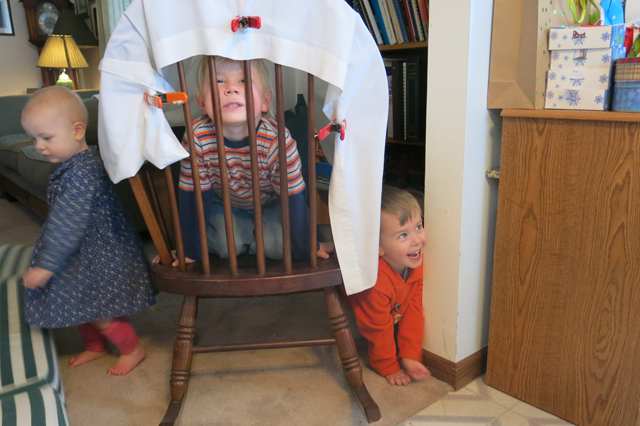 I built a fort for the little ones to play in. 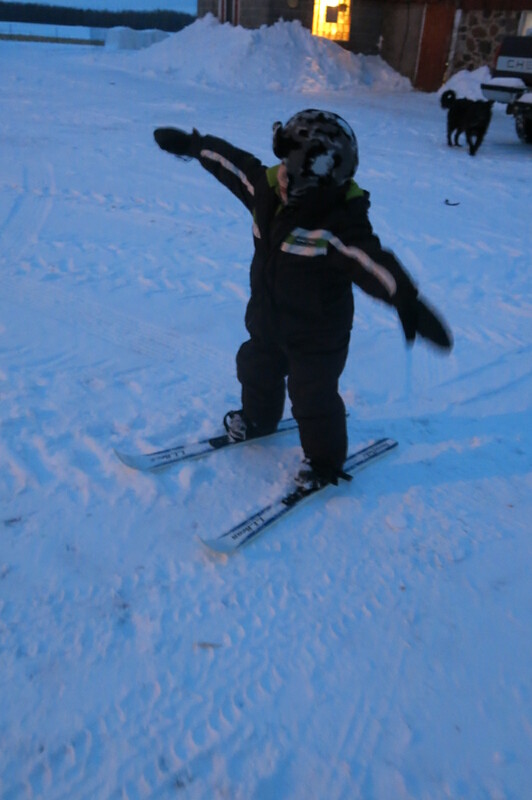 We introduced my nephew to skiing. He was a natural! 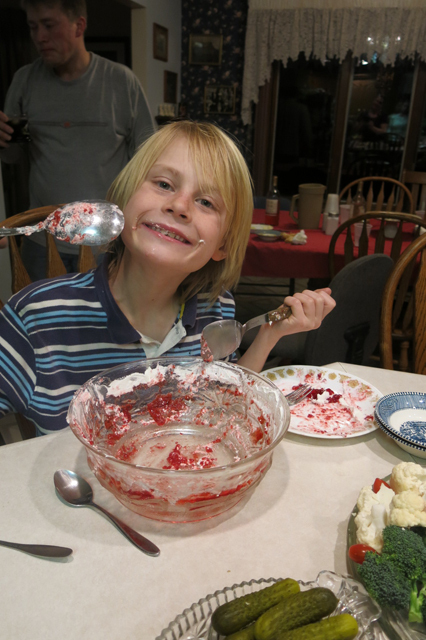 Robbie loves Grandma Hanna’s raspberry jello. Granny made it for our Christmas dinner and Robbie got to clean the bowl. For the last few years my siblings haven’t exchanged Christmas gifts. This year I suggested we do an ornament exchange. 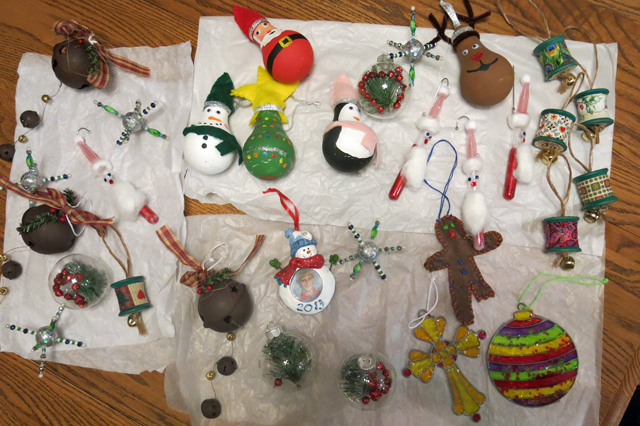 They could be homemade or bought and we needed 7 ornaments (one for each sibling, mom and self). All my siblings participated and made their ornaments for the exchange. I think they all had fun and I hope that we can do it again next year. A long and late drive home. 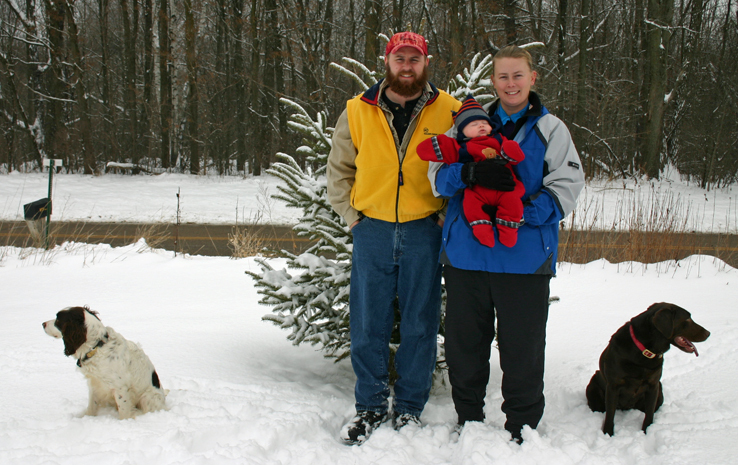 I was looking for photos of Java and found this family photo, taken in early January 2004. We are standing where our wooden fence is now. Same tree behind Jack. Nola Mae has her own cape. 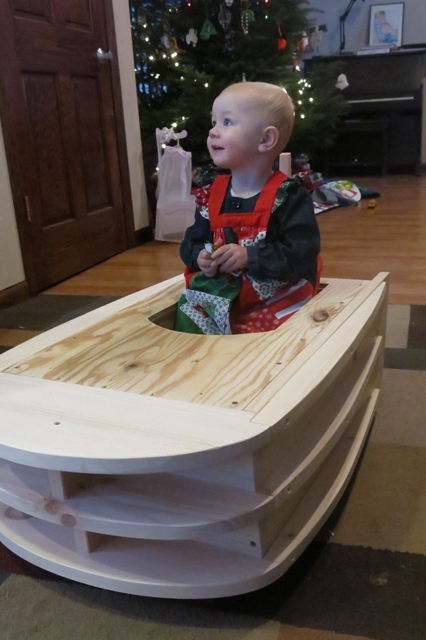 All of our kids got a wooden vehicle for their 2nd Christmas from Papa. 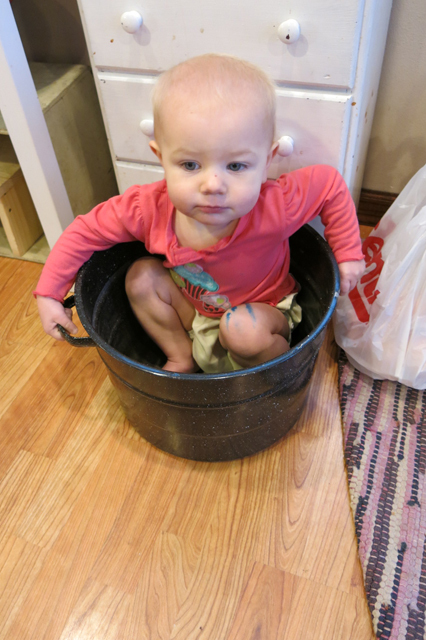 I was in the kitchen cleaning and noticed it was quiet. 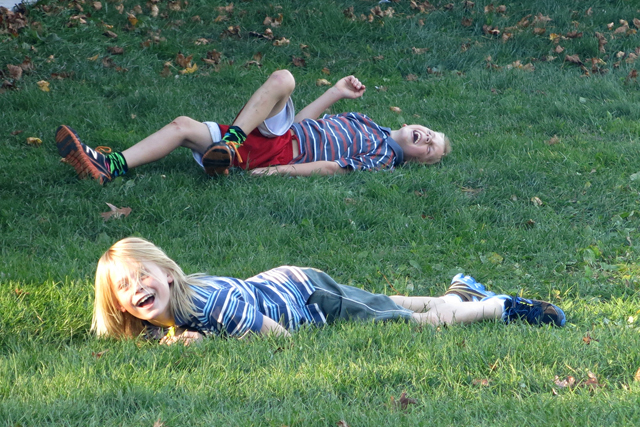 I grabbed the camera and found all these kids playing nicely and quietly. Santa found this brand new snowboard for Henry at St. Vinnie’s. 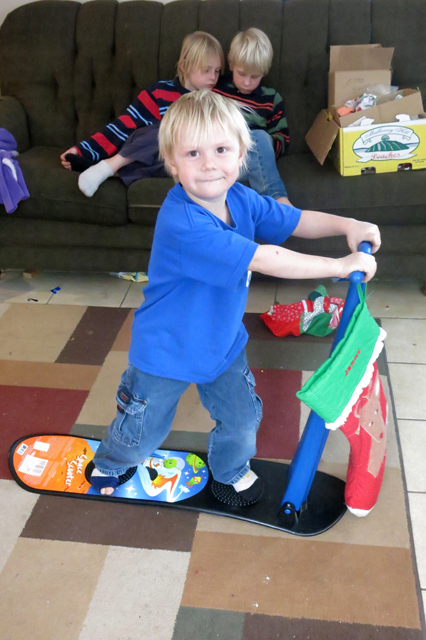 The older boys got a bigger snowboard to share from Santa. Charlie: Do you think Santa really watches us? 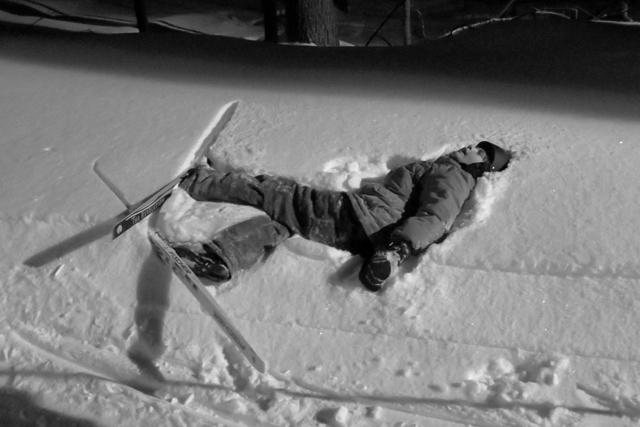 Charlie: He knew our snow board broke. He knew we loved it. And then he gave us a new one. Charlie: Yeah, he is totally real! 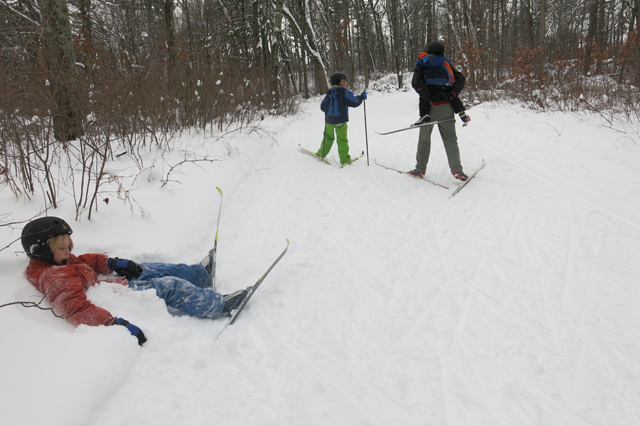 Our family went skiing the day after Christmas. My dog, Java, who was almost 12 years old started looking pretty old this past year. She died on January 30th. I posted a “This Moment” post with a photo of our first two dogs who are both gone now. 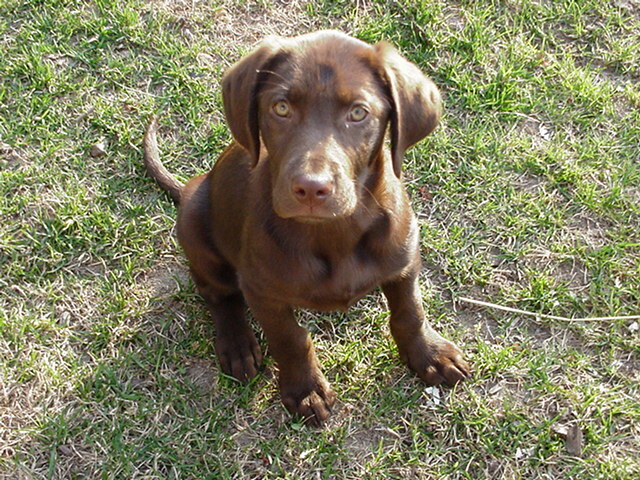 This is Robbie when he was a baby. It will be a long time until I have another dog that I will love as much as I loved those two dogs. 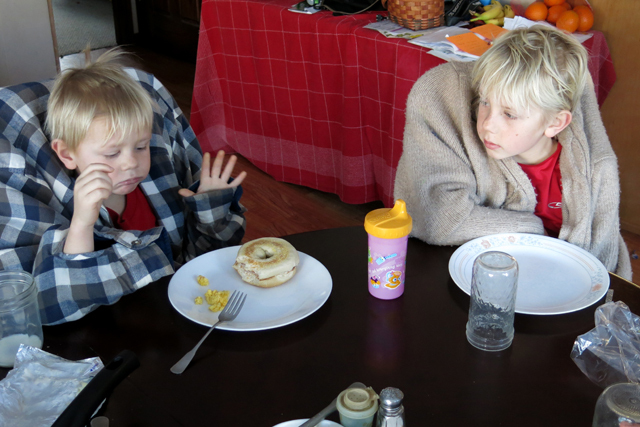 A cold morning at breakfast. 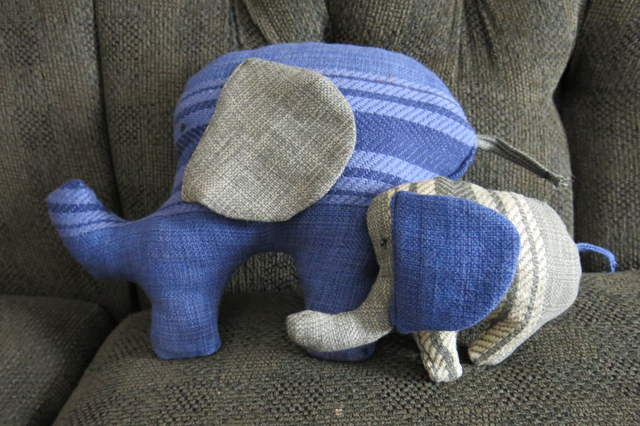 Upcylcled elephants for a friend that is having a baby this winter, made from table cloths from her wedding. I am planning on making her a ring sling from one of those table cloths. I made these two child size Mei Tai for a friend. 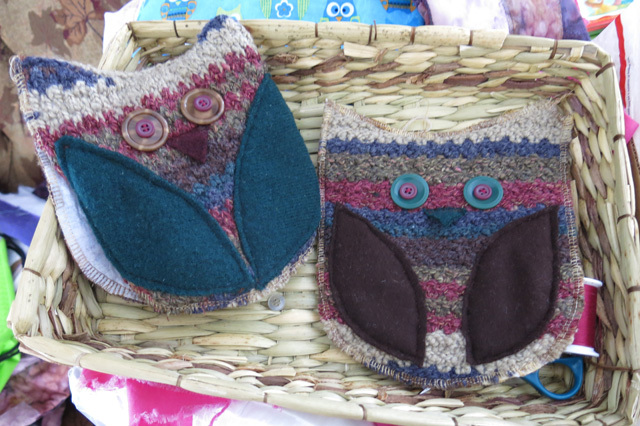 I made these two sweater owls for my youngest nephews for Christmas, upcylced from wool sweaters. 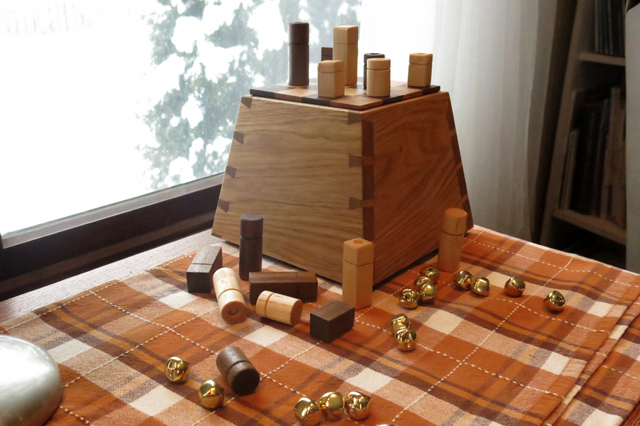 I also made one for each of our kids. 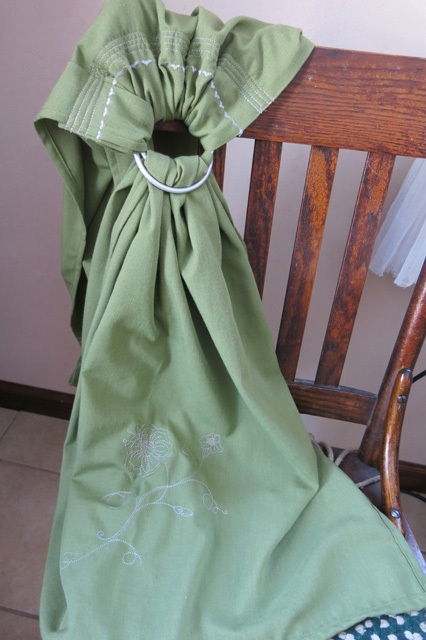 One of the best gifts anyone can give me is time in my sewing room. Jack and the kids stayed busy upstairs, eventually Nola Mae found her way down to the sewing room and sat nicely on my lap while I sewed the binding on the denim Rail Fence quilt that I made for Jack many years ago. 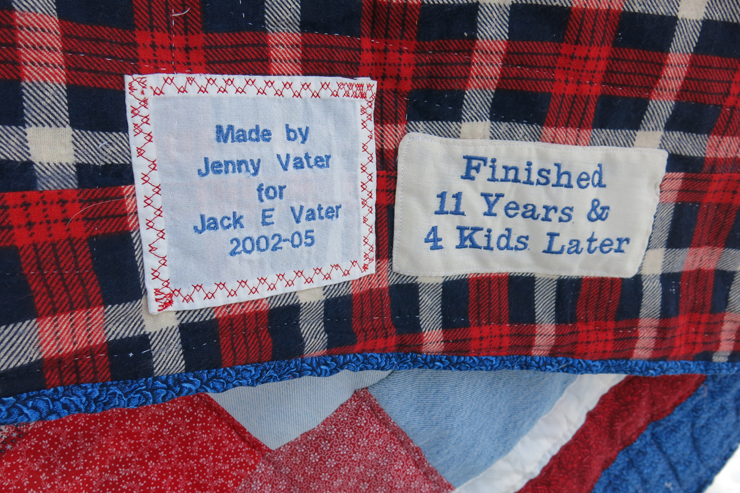 I label all my quilts and when this quilt was close to being finished I anticipated finishing it in 2005. 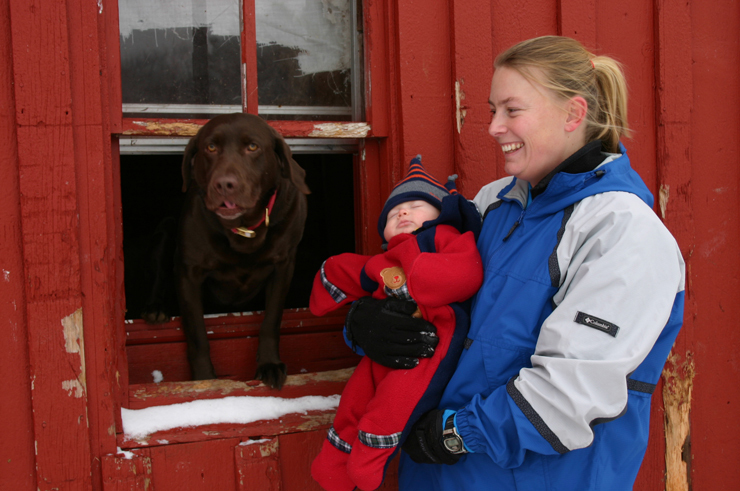 In case you don’t remember in 2002 we had no kids, just two dogs. Robbie came in 2003 and in the summer of 2005 we moved to the garage, gutted our old farm-house for remodeling, lived in the garage and Charlie was born two months before the house was finished. This quilt got worked on off and on over the years. My mom inspired me to finish this one. She has made some very beautiful quilts over the last few years and I felt like I needed to finish this one before starting any big projects. This is my last weekly post of photos for my second year of blogging. I am hoping to continue this on a monthly basis with other posts in between. 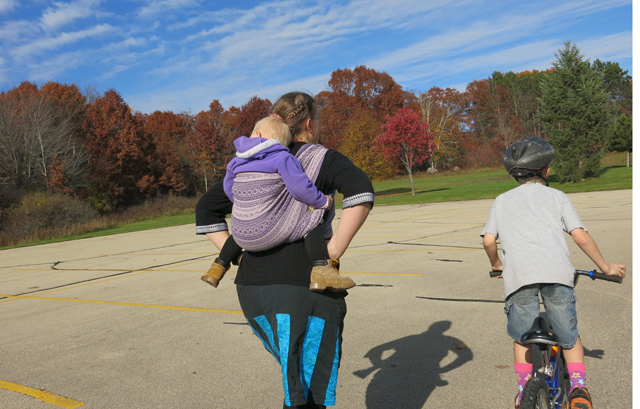 With this change I hope to share more of our funny stories and events with shorter posts and only one monthly overview of what is happening at our house. We spent the weekend before Christmas in multiple places. 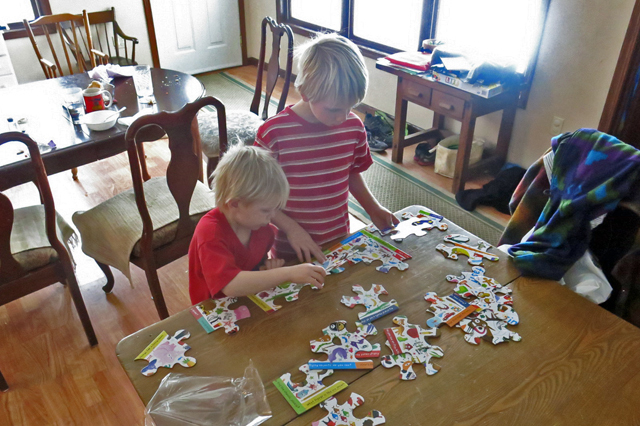 Jack went to his mom’s with the three boys. Nola Mae and I drove to Milwaukee to visit my dad, step-mom and step-grandma and to attend a family wedding. Nola Mae and I spent 9 1/2 hours in the car and put on approximately 426 miles from Friday night to Sunday morning. Sunday we spent with Jack’s family (Vaters during the day and Elorantas in the evening)and late that night we went to sleep at my mom’s. Monday AM we visited with my mom and after lunch we visited Jack’s grandparents in the nursing home. We were home by 6:30pm on Christmas Eve. My grand total of miles traveled from Friday night to Monday night – 525 miles! The most handsome photo of Henry. The older boys got a survival kit from my mom for Christmas with a flint and steel in the kit, we tried it out by the fire when we got home. I was very impressed with the spark they were able to make. Christmas morning’s family photo. Our “always wanting to be handsome boy” insisted on wearing a tie-dye shirt. Not a battle I wanted to take on, at least most of us were coordinating. Oh wait, Jack has an orange shirt under his green sweater! The only homemade thing I made for our boys was Henry’s cape. 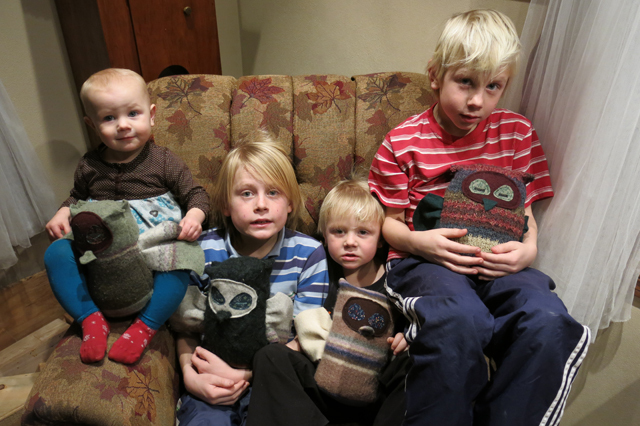 I saved the final sewing for after they were in bed on Christmas Eve. When will I learn not to do that? The fabric was found at St. Vinny’s for about $2 and is reversible. 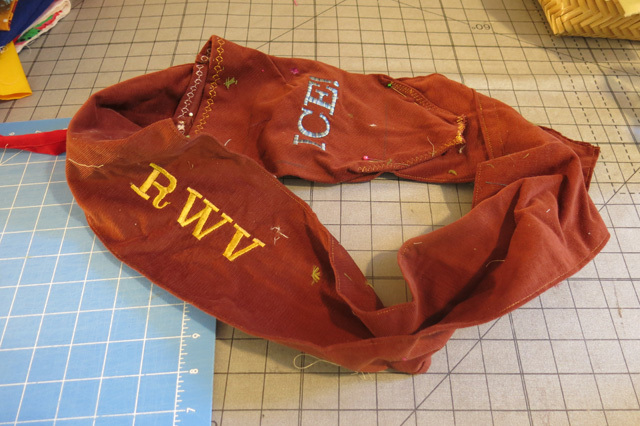 I have been waiting for the perfect project for this piece of fabric. He can fly! Henry tells me he is going to wear it skiing one of these days. I will be sure to have my camera. A favorite photo of mine (almost 9 months old). Christmas day we went out with our snowshoes to try our sledding hill. 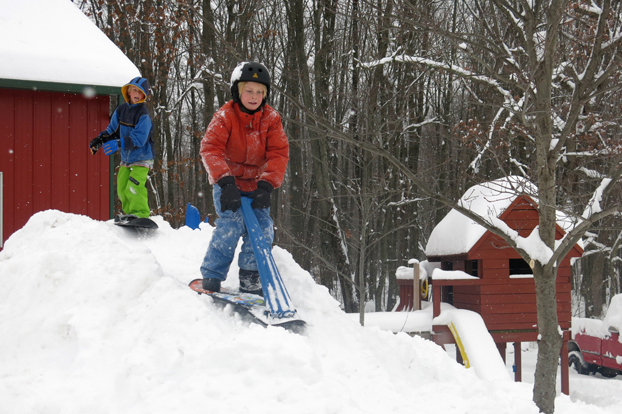 During Christmas break we went skiing with one of Robbie’s friends. This week we had a beautiful snow fall. The snowflakes were huge and the details could be seen with the naked eye and my camera. My neighbor (and dear friend) has a granddaughter (13 yrs old) fighting cancer this winter. I invited the 11-year-old sister to come to my house to sew a quilt for her sister. 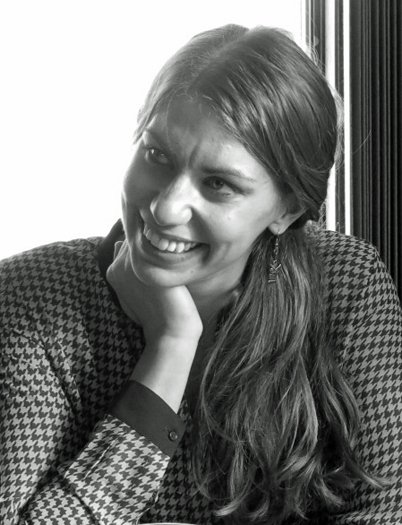 The timing was perfect for us to get together – Anika was visiting her grandparents and the boys were in school. 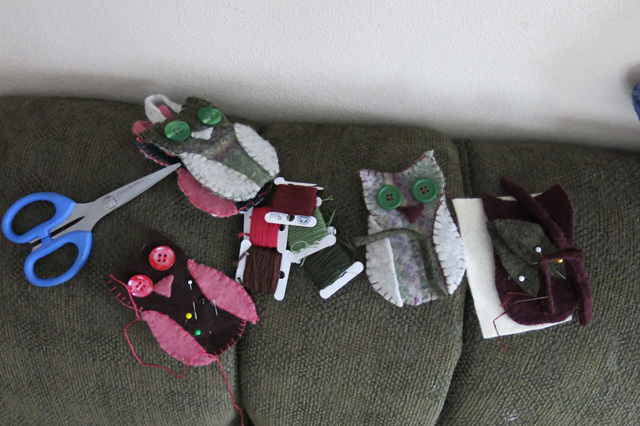 We had so much fun together I am hoping to work on another sewing project with Anika. I think she already has some fabric purchased and ready. 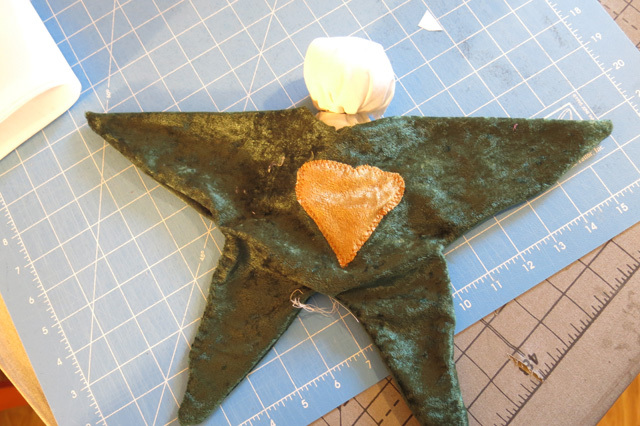 Monday, May 21st: I have been able to make a little progress on Nola Mae’s bear quilt. Tuesday, May 22nd: Tonight was the last night of soccer. Wednesday, May 23rd: Henry started riding his bike today. He needs some help with steering and pedaling. After 15 minutes with my help he showed a lot of improvement. 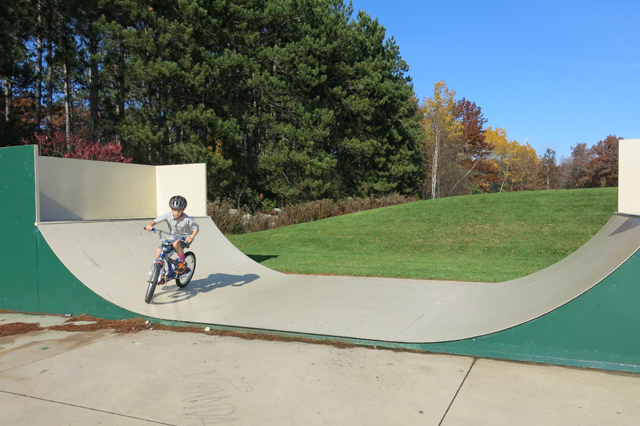 We were staying on the cement in and around the garage until he got a feel for the pedaling. Then I took him on the gravel. 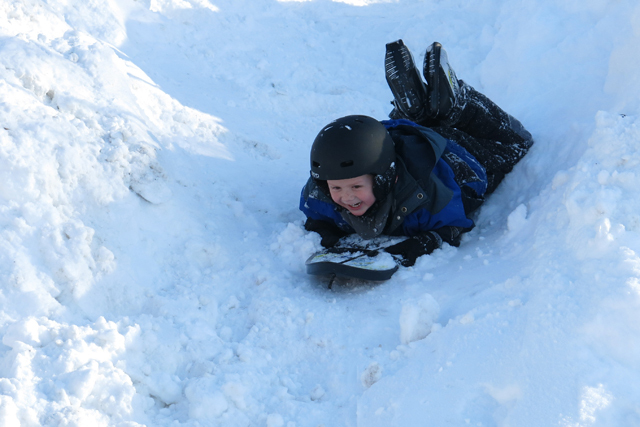 Going down the hill from the garage was a little scary for him and he almost wiped out, while I was right next to him. Later in the morning when Aunt Susie came he showed her his biking. He headed down the garage hill and screamed the whole way. It was really scary all by himself! Aunt Susie thought he was okay doing that by himself. Thursday, May 24th: Henry and Nola Mae spent over an hour at a park with my friend, Kat, while I got a massage. I was very nervous about leaving Nola Mae. Only because I have never left any of my babies for any period of time with anyone, especially when they were 6 weeks old! I really had no reason to worry. 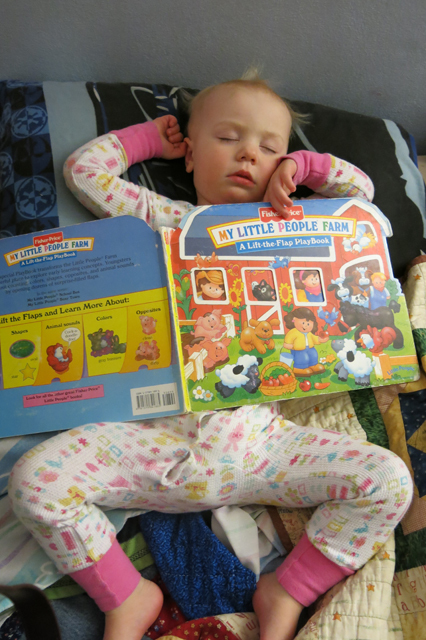 Kat wore Nola Mae in the Mei Tai and she slept the entire time! Friday, May 25th: This is a frequent sight on our fence. The story behind this is…the boys leave the house with their tooth-brushes at least 2-5 minutes before the bus arrives. My plan is that they brush their teeth the whole time it takes to walk to the end of the drive-way and while waiting for the bus. My thought is that if they had to do it in the house before leaving to meet the bus they wouldn’t brush their teeth for very long. This way the tooth-brush is in their mouth for at least two minutes, hopefully being productive! If I don’t make it out to end of the drive-way for one more hug and kiss they put the brushes on the fence for me to pick up later. 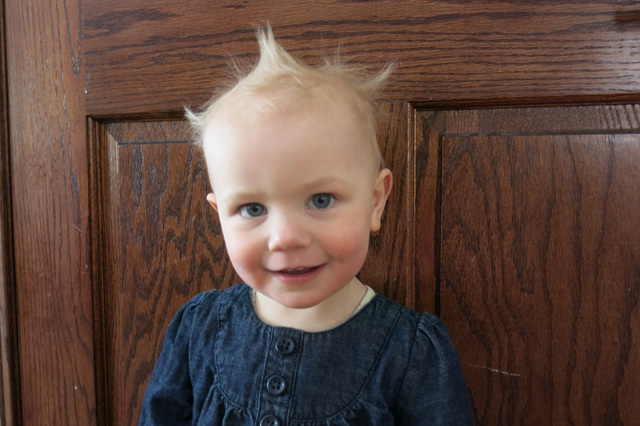 Saturday, May 26th: Jack took this cute picture of Nola Mae. Sunday, May 27th: We went to our Moms’ for part of the weekend. One stop was at Grandma Elma’s. Robbie and Charlie went for a muddy walk in the woods with their cousin Michael. Then we went to Grandma Helen’s where we all went for a walk. Our last stop was Grandma Siggie’s. Nola Mae spent most of her time on Grandma Siggie’s lap. Nola Mae fussed just a little and Grandpa Neil teased Grandma about not knowing how to handle a girl (since she is a mother of four boys). I think she did fine. 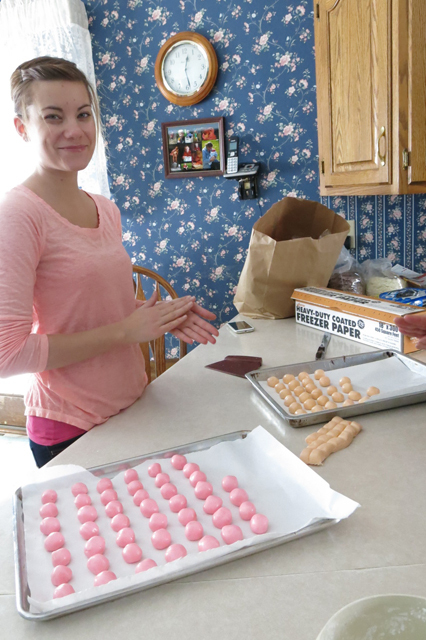 She has more granddaughters than grandsons, so she has had some practice! Monday, May 14th: My friend Kristin wanted to decorate a cake for her daughters’ preschool graduation. She wanted to learn a few tips on cake decorating. We spent the morning together and I walked her through all the steps to decorate her first cake. Click here to see the finished cake. 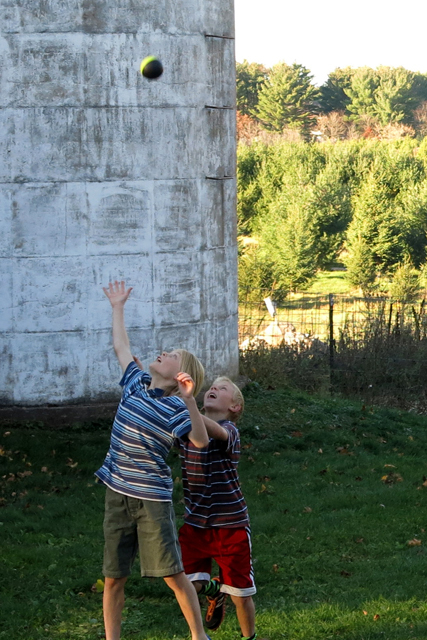 I took the boys into the pasture tonight to get some cool photos of all the dandelion seed heads. The wind the night before blew most of them off. Tuesday, May 15th: We put some eggs in our incubator within a day of Charlie’s kindergarten class in hopes that both of us would get a good hatch. My plan was for it to be worth having the brooder plugged in. Our first chick hatched. My Mother’s Day gift arrived…a worm factory. We got composting worms a week ago and I had been dreading the idea of putting them in the home-made bin that I made a few years ago when we had worms. I was afraid that my worms died because it wasn’t a great design. Wednesday, May 16th: Henry’s request for breakfast was boiled eggs. He helped with a few of the steps. Thursday, May 17th: My sisters Kayla and Emily came to visit. Kayla wore Nola Mae while I planted beets and peas with Henry. Friday, May 18th: Charlie’s kindergarten class hatched some of our eggs. We brought the chicks home today. Before coming home the teacher let the kids hold the chicks. One of Charlie’s classmates was so excited to kiss one of those cute little chicks. Her mom wrote a sweet blog post about it. Click here to see the photo and the short story. After the chicks were put in their new home (our brooder in the garage) I noticed the ones that came from school were less skittish. Our chicks haven’t had much handling or peeking at due to the dangerous grip of a three-year old. Henry can be gentle with eggs. He needs a little work with chicks! 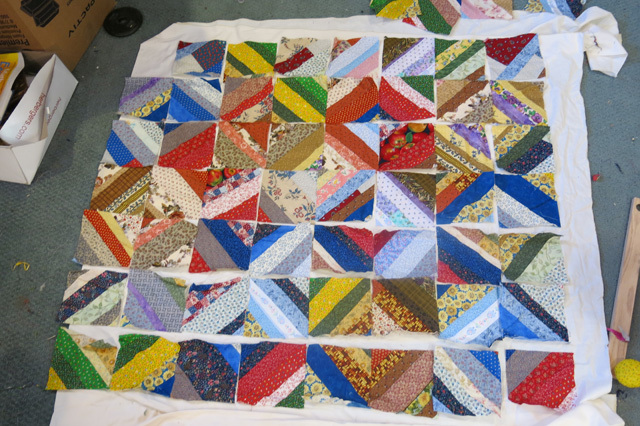 Saturday, May 19th: Nola Mae’s baby quilt has been started. 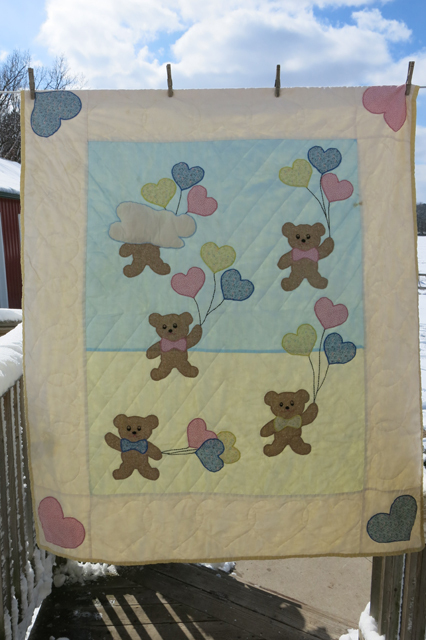 I am going to use the Tumbling Bears quilt design. There will be 12 bears with 12 different prints of purple. Monday, April 30th: This quilt arrived in the mail from my friend Jan. I love it. 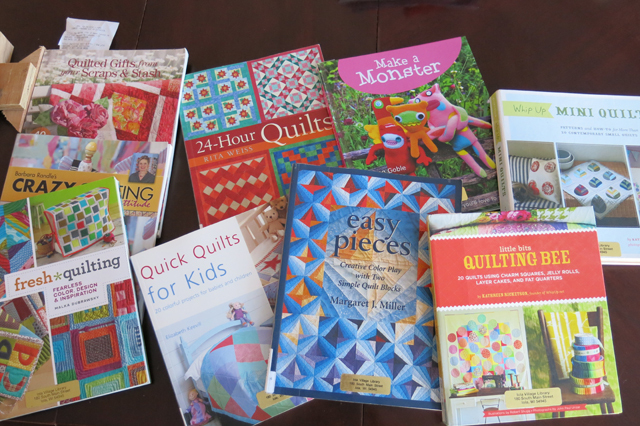 After cuddling with Nola Mae and inspecting the quilt I am inspired to do more sewing. 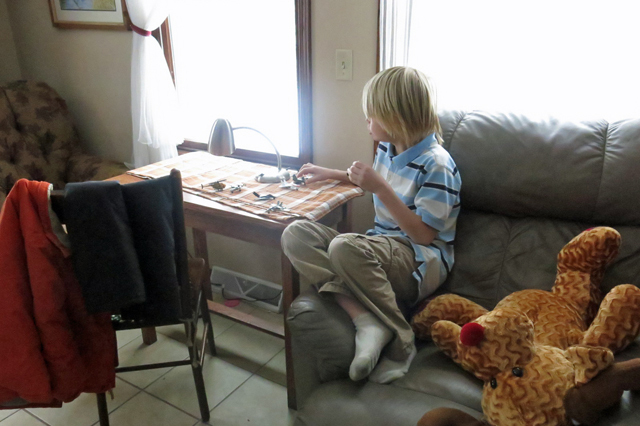 I wonder when I will be able to get into the sewing room again! Tuesday, May 1st: This hat came from Donna in New Zealand. Some say Nola Mae looks like a pirate. I think she looks like an elf. Soccer started today. The boys played at the same time on different fields. We split up our time and watched 15 minutes of each game. Wednesday, May 2nd: Henry making scrambled eggs. He did all the steps by himself. Here are some of my spring flowers. I needed to take a photo since I have a little boy who likes to pick them for me and for Mrs. Fechter (Charlie’s teacher). Henry picks them and the stems are always too short for a vase. I haven’t been able to show him how to pick flowers with long stems. Thursday, May 3rd: Another soccer game this week. Henry cuddling with Nola Mae. 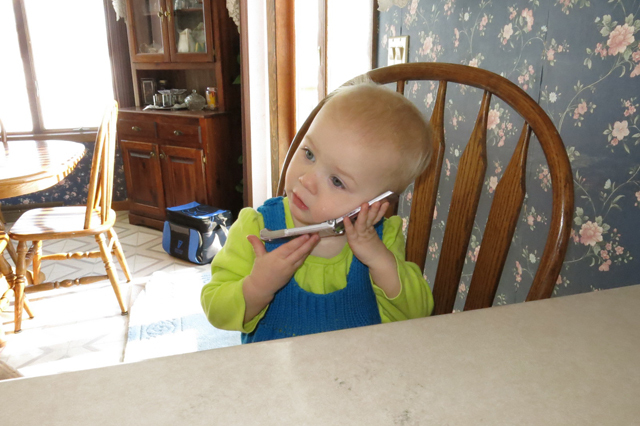 Friday, May 4th: Henry talking to Granny. Henry and I made cinnamon rolls for our company coming this weekend. 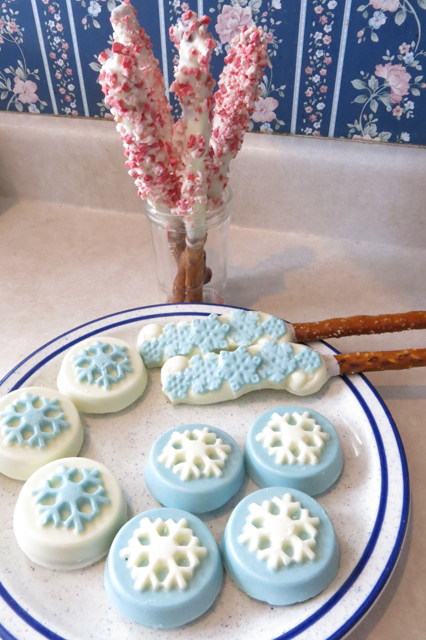 I made a double batch and put all these in the freezer for another time. Grandpa Jerry came for a short visit. Saturday, May 5th: My brother and his family were here this weekend. After they left Henry finally sat down to eat his lunch. For the life of me I couldn’t get him to stay in his chair when everyone else was eating. 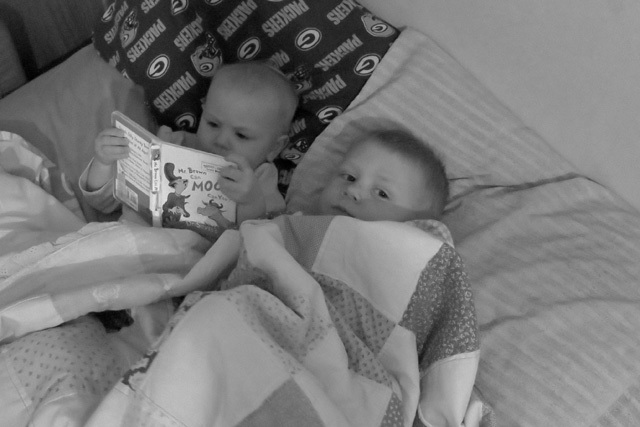 and reading to Henry about hot lava. Henry was talking about hot lava being on the floor. Sunday, May 6th: It rained all morning, 3 inches! The boys’ pond filled up and the field developed some ponds that I have never seen before. We, mostly Henry, washed the mirrors in the toy room. I attempted this back carry today on my own while looking in the mirror. I still need a little practice. Nola Mae was wide awake when we started and within minutes she was sleeping. She slept for almost two hours. I cleaned a little, made lunch, ate a hot lunch, and did some sewing. I had to take her down to wake her up because my body was wondering where the hungry baby was. I have been working on this Mei Tai for my cousin Jessie. I was able to finish it this afternoon. 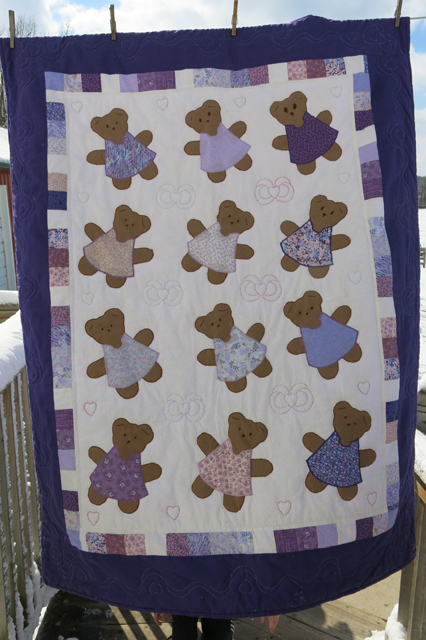 Monday, April 23rd: Granny made this quilt for me. 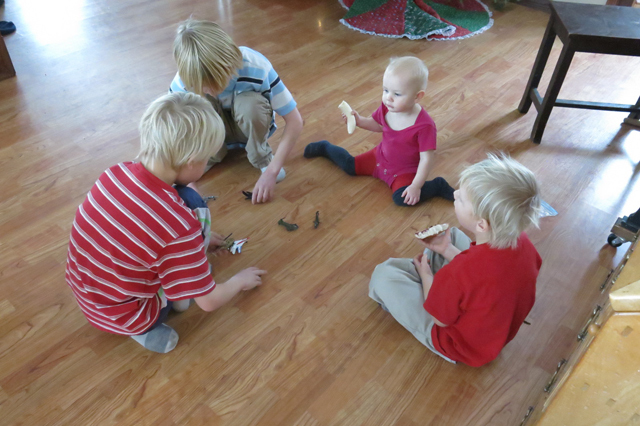 Tuesday, April 24th: Another playdate for Henry this week. These other two boys are in the same school district as us and they will be in the same grade as Henry. Wednesday, April 25th: Charlie’s kindergarten class is hatching some of our eggs this spring. I am hoping they get a good hatch. I was inspired to set eggs in our incubator and wanted to be on the same schedule as Charlie’s class. I was thinking 12 eggs was a good number and then Robbie convinced me that 24 would be better. Jack made this box, since the color turned out more pink than red Nola Mae is now the lucky owner. Thursday, April 26th: I haven’t had caffeine since I got the flu. I have been drinking decaf coffee and now that is gone. The only coffee I had in the house needed grinding and happens to be 50/50. I can use a little caffeine! 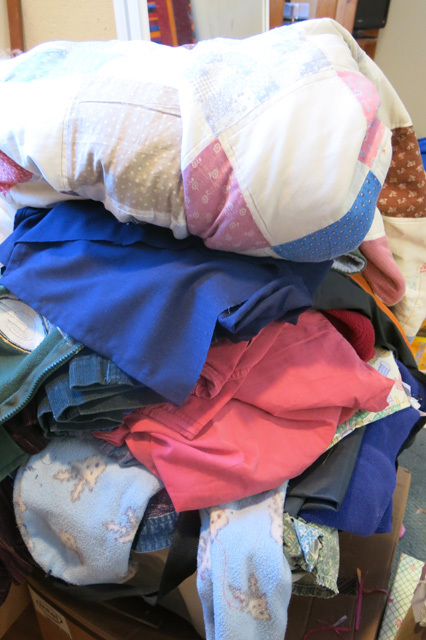 Friday, April 27th: We received a lot of hand-me-down clothes for Nola Mae in the 0-3 month size. This is one of the very cute onsie that was in the boxes. She isn’t very happy here, maybe she is thinking of being the only sister to three wild brothers. 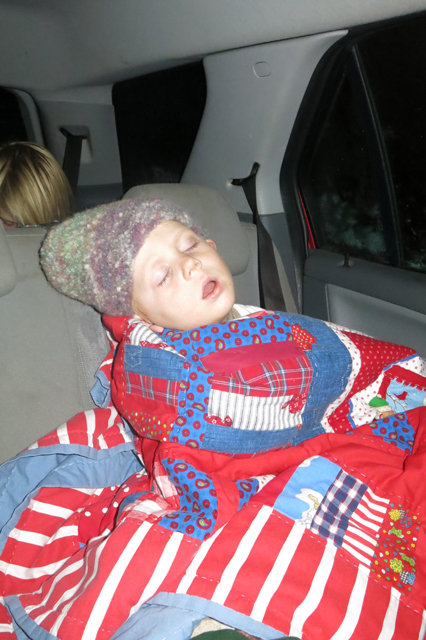 Henry bumped his head a couple of days ago while walking around the house with a blanket over his face. He can put his own band-aids on. 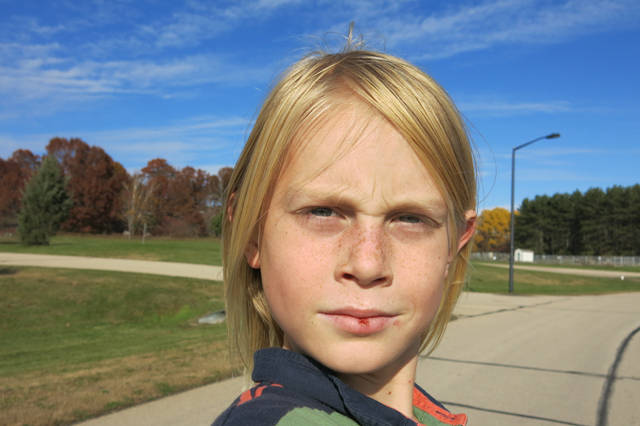 Thankfully he still had this band-aid on today because he bumped his head again. Saturday, April 28th: Jack was busy planting trees and making firewood today. I wrapped up Nola Mae and we went for a walk to meet Jack and the boys. I found these nasty tent caterpillars on one of my flowering crab apple trees. This tree isn’t close to the house so they have gotten out of control. I remove them as soon as I notice them on my other crab apple trees and apple trees in the yard. 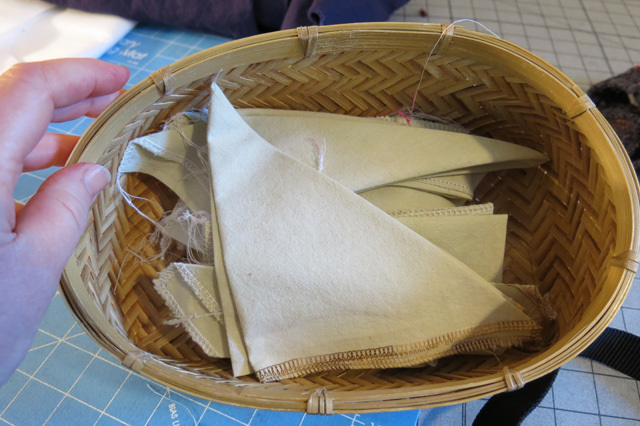 Sunday, April 29th: My first attempt at sewing with Nola Mae. She wasn’t happy at first. 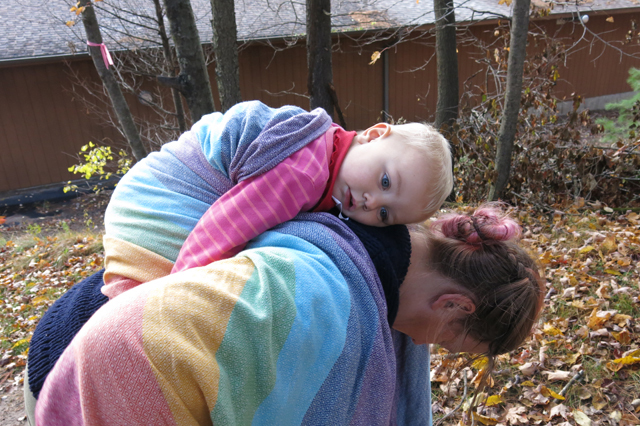 Then I put her in my wrap and she instantly fell asleep and slept the whole time.